Alva Parks Brown born 23 Nov 1838 in Elba, Genesee, New York to Orsemus L. Brown and Diantha Parks. Alva married first Martha Jane Ennis 24 Oct 1870 in Texas, Henry, Ohio. Martha was born 10 Aug 1849 in Union County, Ohio to Alonzo Havington Ennis and Olive Bird. In 1865, her family moved to Texas, Henry, Ohio. When Martha was 19, her mother died in childbirth, along with the baby. Her older sister died at age 23, when Martha was 21, leaving her the eldest living child in the family. Alva was a salesman who ran a huckster wagon to county fairs. He also sold door-to-door. He sold a variety of items, such as seat springs and water pumps. According to his grandson Frank Boyd, he also sold rotten wood as bedbug powder. He was also an inventor who obtained several patents. Two of these were a patent for a spring bed-bottom granted 18 May 1875 and a patent for a bedstead granted 17 January 1882. Martha's nephew Calvin Ennes wrote, "Young Sylvester Beecher Ennes [Martha's brother and Calvin's father] traveled with Albert [sic] on his many trips. It was a hard life for them and a harder life for Martha, his wife, who lived with her father at the Old Ennes Farm taking care of her children. After Ordella died in 1871, Martha was the oldest. Alonzo Ennes gave her the Old Family Bible." Calvin described life on the Ennes farm: "[Alonzo] had his children work in the fields too, with him…Those were busy days for the girls on the Old Ennes Farm at Texas. They not only did the housework and work in the fields but they made the hundreds of tallow candles needed for lighting the home, and also those used in the many square-tinned lanterns used in the barns and stables. The girls also made the lard and the apple butter over an open fire in a large iron kettle outdoors. In fact, they made nearly everything except the shoes they wore on their feet." Tragedy struck again when Martha's father died from sepsis due to an accidental cut to the hand when Martha was 29. 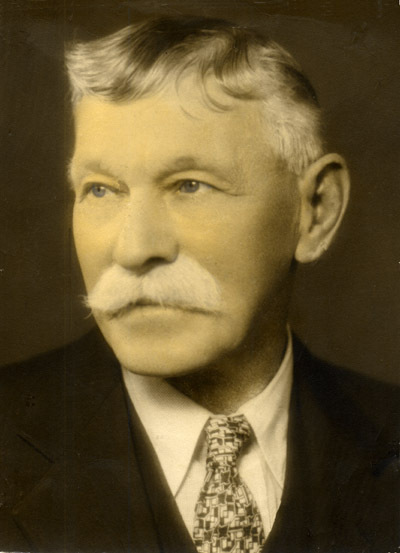 Calvin Ennes stated that, "Over the years, Alonzo bought many farms so the Alonzo Ennes Farm at Texas, Ohio was originally composed of many smaller places with buildings on each of them. These farms were located north of the Canal on the east side of Texas. After Alonzo's death in 1879, each of his children, with the exception of Lincoln…was given a portion of his holdings.…Martha Brown, with her large family inherited the Alonzo Ennes home, buildings and land where she and the Ennes family had lived." Martha was also given $10.72 from her grandfather William A. Ennes's estate in 1882. 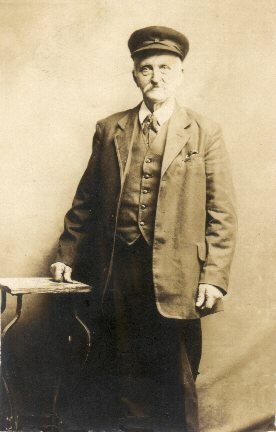 Alva was listed as a farmer in 1880 but it is unclear whether he gave up his occupation as a salesman to run the farm. His parents were enumerated in the next household but it was noted under occupation that his father "works on farm" and his mother "lives with son." Martha filed for divorce 1 November 1880. A divorce hearing on 25 Jan 1881 at Napoleon, Henry, Ohio. At this time, Martha accused Alva of "gross neglect and Extreme cruelty" and reported two incidents in Oct 1880 where he beat her. She also stated that he abandoned the family, taking "all the household goods and provisions belonging to the family and all the clothing of said plaintiff & her children except what they had on, taking then and there even the pillow from under their infant child lying in a rocking chair." Alva denied the allegations and in turn, accused her of "gross neglect of duty" towards him, of being the one who deserted him and the family on 18 Oct, and of adultery with an Ely Bolinger. The divorce was granted 11 Feb 1881 and Alva found guilty of extreme cruelty. He was ordered to pay alimony. Martha was granted custody of the children. Alva and Martha remarried later that year, however, on 1 Aug 1881 in Napoleon, Henry, Ohio. The second marriage didn't last and they divorced a second time in 1886. Alva published a legal notice in the local newspaper, praying for a divorce from her on grounds of "gross neglect of duty" and informing Martha "whose place of residence is unknown" of a hearing on or after 10 Aug 1886. The granting of the divorce was reported in the local newspaper 7 October 1886 and it was noted that the divorced was decreed at the costs of the plaintiff (Alva). Alva moved to Indiana after the second divorce. He married second Louisa A. Thoman 14 Aug 1888 in Fulton county, Indiana to Jacob and Caroline Thoman. Louisa was born 9 Jan 1868. They were living at Hillsdale, part of Helt, Vermillion, Indiana 30 Jul 1895, when Alva was granted a patent for a design for a chair. He was listed as a farmer in Helt in 1900. The Browns moved to Michigan in 1903 in a covered wagon. There, his grandson Frank stated that he owned a broom factory in Battle Creek, Calhoun, Michigan. While it is not certain whether he owned a factory, he does appear in a Battle Creek city directory as a broommaker, living at 574 West Van Buren Avenue. At the time of daughter Leona's marriage, they were living at a farm home at what later became Fort Custer in Michigan. Alva wrote a letter that was probably dated around 1917-8, in which he gives his address as "574 west vabren Batel Crick Mich" (574 West Van Buren, Battle Creek, Michigan). The letter, probably written to one or more of his children by Martha, states, "I feer I shall never Have the Plesher to see you all a gane." It is evident in the letter that his daughter Bertha had previously written to him but had not done so in some time. Alva was apparently committed to an institution in the last decade or so of his life. He appeared twice in the 1920 census, once in the family home on West Van Buren Street in Battle Creek (but with the note "State Hospital" under occupation) and once as an inmate in the Kalamazoo State Hospital. 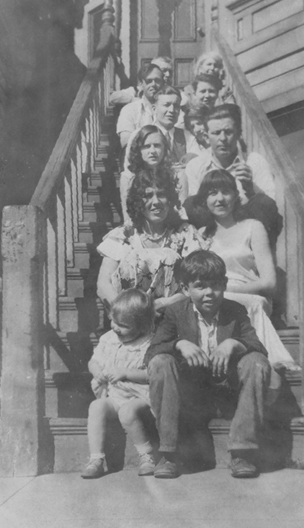 Louisa was living at West Buren Street with her son Charles, his wife Mima, and their daughter Geraldine. She was working as a housekeeper in a hospital. Alva died 14 June 1929 at the Kalamazoo State Hospital, Kalamazoo, Kalamazoo, Michigan of myocarditis and cardiac failure with arteriosclerosis as a contributing factor. He was buried 16 June 1929 at Banfield Cemetery, Banfield, Barry, Michigan. About a month later, on 21 Aug 1929, Louisa suffered a brain hemorrhage but survived. She was enumerated in Battle Creek in 1930, still at West Van Buren Street, with one roomer. Louisa died 15 May 1931 at Nichols Hospital in Battle Creek, Calhoun, Michigan of a cerebral hemorrhage. She was buried 18 May 1931, next to Alva, at Banfield Cemetery, Banfield, Barry, Michigan. Martha left Ohio after the second divorce and moved to Arkansas. She took all of the children from both her first and second marriage to Alva. Calvin Ennes wrote that, "Shortly after her father Alonzo died in 1879, Martha left Brown, took her family, the Bible, which had the Ennes family records back to 1666 in Ireland, few belongings and went to Arkansas. On the way the boat was wrecked while on the Mississippi. The Bible and her belongings were lost, but the family survived. 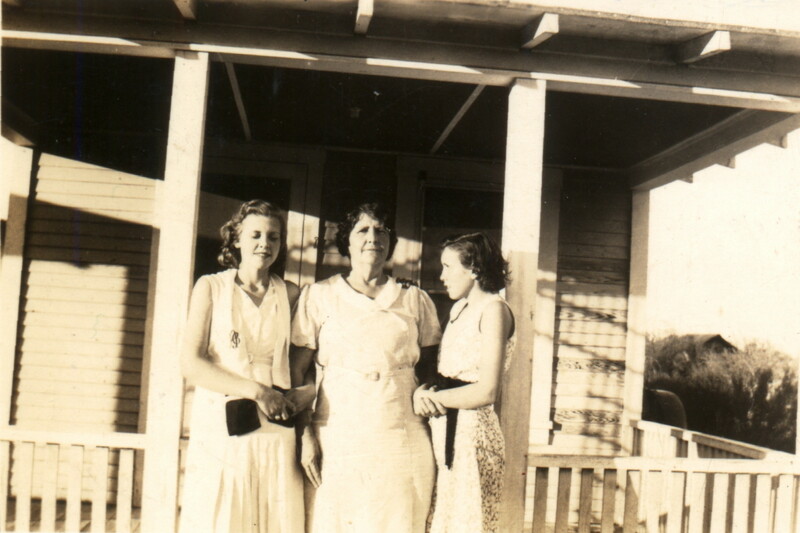 Several years later she came back to Texas with her youngest son Edward and visited. She was never heard from again after she returned to Arkansas." Note, however, that there are several incorrect facts in this statement. First, it can be seen in contemporary records that he did not leave soon after her father's death in 1879, but in 1886, after the second divorce. Second, Calvin stated elsewhere in his history the belief that the family once held that the first Ennes ancestor in America was one of three brothers from Ireland. There is no evidence to support this descent. The Ennes' likely first American ancestors were Alexander Innes, a Scottish prisoner of war transported to New England as an indentured servant and, his wife, Catherine, an Irish woman (possibly also transported and indentured involuntarily). Lastly, Calvin's version of the story about the Bible may not be accurate. The story, as passed down to my grandfather, Martha's grandson, was that the Bible was lost in a flood sometime after Martha and her children had settled in Arkansas. Before Martha left Ohio, she had been led to believe that she had purchased land in Arkansas but discovered that it was merely a lifelong lease and she would not be able to do as she had planned, which was to improve the land and rent or sell it. She was listed living in Spring, Lincoln, Arkansas in 1900. Martha died in 1910 in Little Rock, Pulaski, Arkansas, according to information passed down through her grandson Frank. Her grandson Frank Boyd also passed down information he had heard about his grandmother's appearance and personality. According to him, she was redheaded, bragged about having "blue blood in her veins," was selfish, vain, and a "man-hater," "lived a hard life" of poverty, farmed and sold eggs, and loved coffee and sugar. 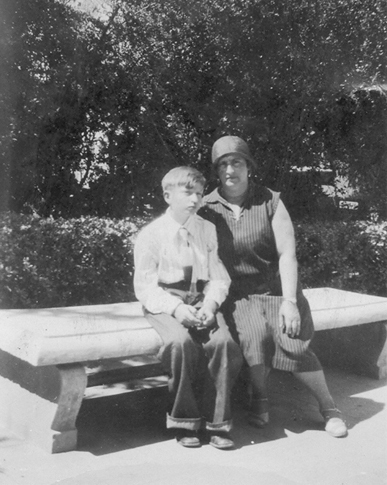 She may have gone by Mattie for short, as she appears in Social Security records for her son Homer as Mattie Ennis. Beecher Brown, born about 1872 in Ohio (according to the 1880 census, which calls him Beecher) or about 1784 (according to Alva and Martha's divorce papers, which calls him Alva Beecher), married Hattie --. No birth records have been found for an Alva Beecher. It is interesting to note that there is a record of a Beecher Delos Brown, born 10 Aug 1871 in Eaton county, Michigan to Alva P. and Martha Jane Brown. 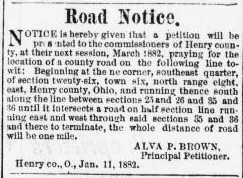 This date is the right year but in a different location than what is stated in the 1880 census, though it may still be possible that the Browns had been in Michigan for a short time (especially considering Alva's profession). The name Beecher Delos is particularly interesting, as Martha had a brother named Sylvester Beecher Ennes and Alva had a brother named Tristram Delos Brown. Could Alva Beecher and Beecher Delos be the same child (perhaps one of the records had an incorrect name? Or could there have been two children (a Beecher Delos and an Alva Beecher) and Beecher Delos died young and was not counted among the children in the divorce papers? Wife: Hattie --, name of Beecher's wife, according to family tradition. A photo exists for her and is shown below but no records have been found to confirm her name or give additional details about her life. Alonzo Orsmas Brown, born 10 Feb 1876 in Washington, Henry, Ohio, enumerated in the 1880 census. 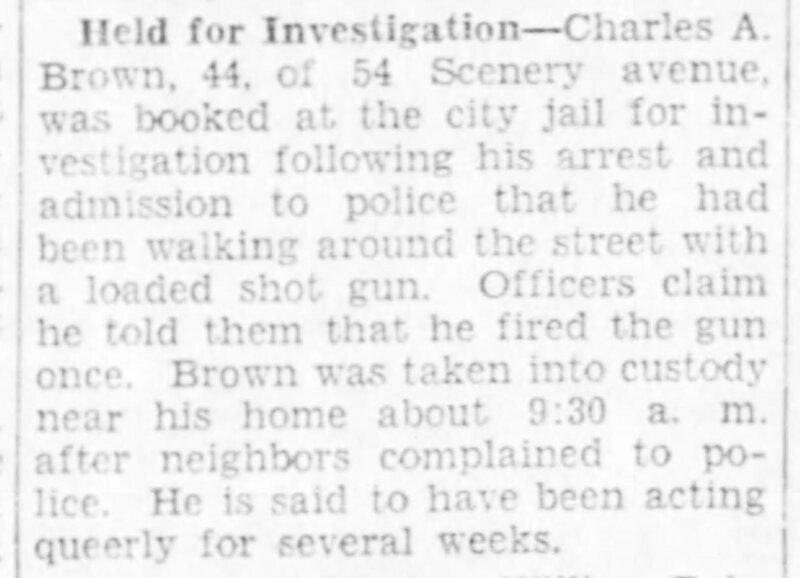 James Ennes Brown, said to have confronted the man who cheated his mother of land and when the other man went for a derringer in his pocket, shot him, then fled (he "was always feeling like he was chased by the law," according to his nephew, Frank Richard Boyd), went by the aliases Alonzo J. Ennes, married 1) Ada Jane Arnold about 1899, lived and farmed in Justice Precinct 3, Hemphill, Texas in 1910, divorced and moved into his niece Ellen (Boyd) and her husband Frank Helm's home in Clark, Yavapai, Arizona by 1920 (under the name James A. Ennes), worked as a laborer at a smelter in 1920, started going by the name James Ennes Brown from sometime between 1920 and 1927 until his death, married 2) Luz Bedoya 8 Aug 1927 in Pima county, Arizona, lived in Laveen, Maricopa, Arizona in 1928, lived in or near Ajo, Pima, Arizona until "he got where he thought they [the law] were catching up with him" (according to his nephew Frank), lived and worked as a farmer (working with stock cattle) in Oceanside, San Diego, California in 1930, recorded as a rancher at Hipass Station, San Diego, California in 1935 and 1937, obtained a land patent in San Diego county, California (on the United States-Mexico border) 18 Dec 1936, lived in Jacumba, San Diego, California in 1940, died 6 Feb 1960 in San Diego county, California, buried at Greenwood Memorial Park, San Diego, San Diego, California. 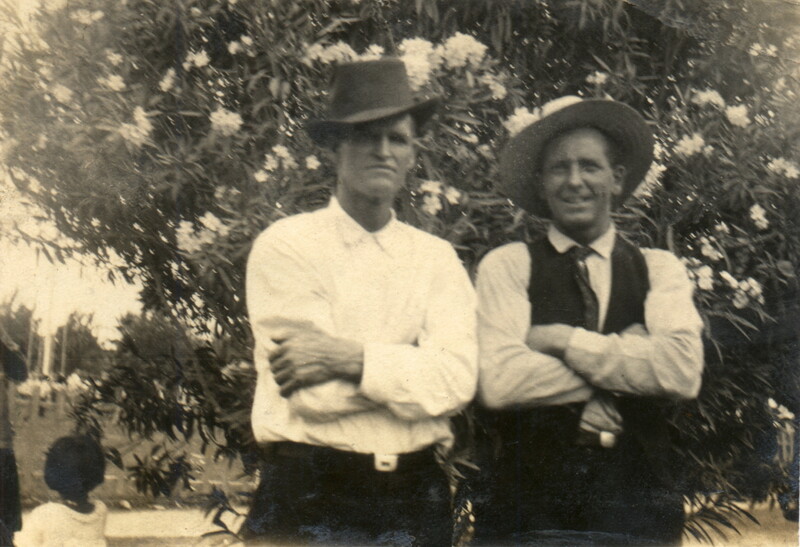 According to his nephew Frank, Jim would carry a twelve-gauge shotgun with him at all times after he started homesteading on his patent and that one time he was driving his Model T Ford when the gun fell over and blew holes in the back of his car. No birth record for a James Ennes Brown has been located. The date of his birth is confusing as he appears in one record as having been born about 1887, in family tradition as born 16 May 1882 (but this is his brother Homer's birthdate and there is no tradition of them being twins--this is likely an error), and in some records as born 10 Feb 1876 in Henry county, Ohio (although no James was listed in the family in 1880). As Jim was on the run, the possibility exists that he and Alonzo Orsmas Brown were the same person (that he was born Alonzo Orswas Brown, fled and took on the name Alonzo J. Ennes, moved to Arizona and took on the name James A. Ennes, then finally James Ennes Brown). Alternatively, he may have assumed the birth date of his deceased older brother, Alonzo Orswas, although it is not clear why he would feel the need to do so if he felt safe enough to return to using his original name. While I somewhat favor the first scenario (Alonzo Orswas assuming the alias of James Ennes Brown), I am not absolutely certain. Therefore, I have left Alonzo Orswas Brown and James Ennes Brown as two separate children. For more information on this and on the identification of his first wife and their children, click here for a PDF of my analysis. 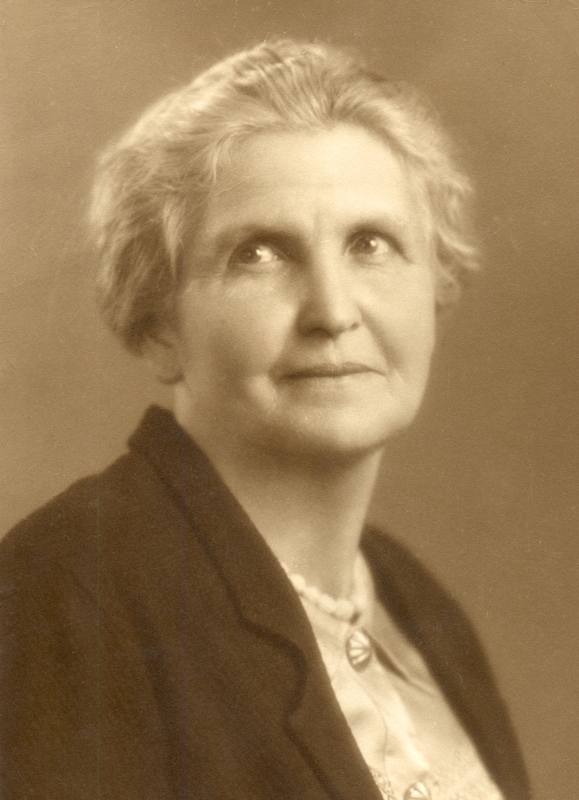 Wife 1: Ada Jane Arnold, b. 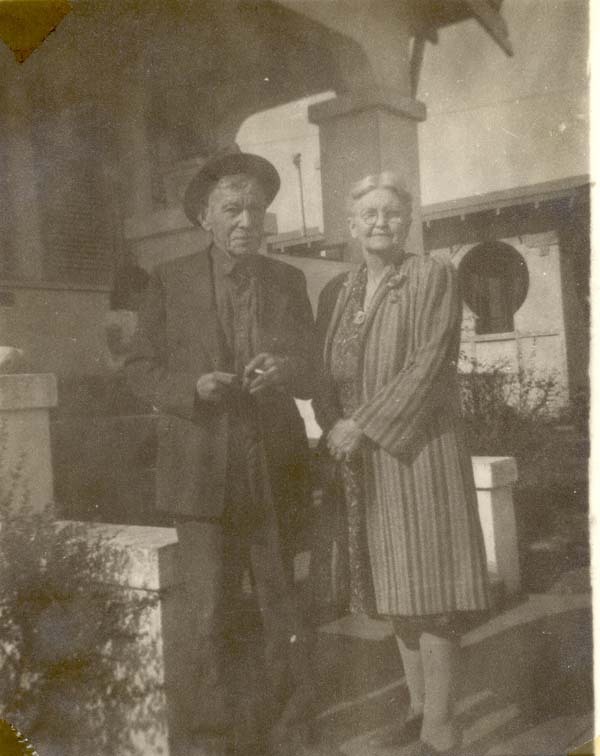 9 Jun 1878 in Arlington, Tarrant, Texas to Thomas O. and Alice G. (Strahan) Arnold, lived in the Tularosa, Otero, New Mexico in 1920, lived in Fairview, Sierra, New Mexico in 1930, listed as a teacher in a public school in both the 1920 and 1930 censuses, d. 1 Sep 1953, bur. Hot Springs Cemetery, Truth or Consequences (formerly Hot Springs), Sierra, New Mexico. She is listed as "Ada Ennesarnold Choran" in Social Security records. I'm not sure if this means that she married a Mr. Choran or if this was an error in either the record or the indexing. She was listed as Ada Ennes, not Choran, on her gravestone. Wife 2: Luz Bedoya, b. 29 Dec 1908 in Caborca Viejo, Sonora, Mexico to -- Bedoya and -- Velasco, made and sold candies at Wisteria Candy Cottage in Boulevard, San Diego, California in the 1940s, buying this business in 1950 (business passed down to her daughter LuzCelia and her daughter--click here for the candy kitchen's website and a video about it), d. 29 or 31 Dec 1993 at Community Convalescent Center, La Mesa, San Diego, California, bur. Greenwood Memorial Park, San Diego, San Diego, California. Children (by Ada): Ory Lewis Ennes, Leon Fredrick Ennes, Lavora Olive Ennes, and Irene Lovena Ennes. Children (by Luz): James William Brown, Ordella Margarita Brown (source for her middle name: see Ordella Margarita Brown in Ancestry.com. California Birth Index, 1905-1995 [database on-line]. Provo, UT, USA: Ancestry.com Operations Inc, 2005. ), Yshmal Louis Brown (also spelled Ishmael Luis Brown; sources for his name: see Ishmael Luis Brown in Ancestry.com. California Birth Index, 1905-1995 [database on-line]. Provo, UT, USA: Ancestry.com Operations Inc, 2005. and Yshmal Louis Brown in Ancestry.com. U.S., Social Security Death Index, 1935-2014 [database on-line]. Provo, UT, USA: Ancestry.com Operations Inc, 2014. ), Luzcelia Brown, and and one other now living. Bertha Amanda Brown, born 13 Jan 1878 in Washington, Henry, Ohio, married William Henry Boyd 16 August 1897 in Grady, Lincoln, Arkansas, helped supplement her family’s income by taking in washing, having a vegetable wagon, and keeping cows, chicken, rabbits, and pigeons, also planted beautiful flowers (but her husband would dig up the flowers to plant vegetables), was a practicing Seventh-day Adventist, loved mustard greens and berries, lived in Pine Bluff, Jefferson, Arkansas in 1910, became sick with tuberculosis and was instructed to go to a warmer climate, moved to Texas (living for a time in El Paso), owned a business (either a laundry or a bakeshop), may have returned to Arkansas for a time, lived in Clarkdale, Yavapai, Arizona in 1920, also lived in Prescott, Yavapai, Arizona (according to son Frank), moved to Phoenix, Maricopa, Arizona by 1922, moved to Laveen, Maricopa, Arizona (where the family operated a dairy), sold the dairy and returned to Phoenix (where the family owned a store made of old signboards attached to their house), said to have oil lands in New Mexico for a time (but lost it when William Henry didn't pay taxes on it), moved to Marysville, Yuba, California in 1929 after the mine where William Henry worked closed and the store was unable to produce enough income (drove in a soft top 1928 Dodge touring car with her two youngest children, worked at the Del Monte cannery in Gridley, Butte, California, took her youngest to Baptist and other churches (as there were no Adventist churches in the area at that time) and paid tithing to various churches (even though they were poor), moved to Oakland, Alameda, California, then to San Francisco, San Francisco, California in about 1930-31, moved out of the family home for a time after learning that her youngest son Frank had witnessed William Henry (and perhaps other family members) counterfeiting and took in laundry in Oakland to support herself and Frank (the rest of the family later moved to Oakland), worked for the Works Progress Administration (WPA) during the Depression as a seamstress on a variety of projects, died of cervical cancer 6 June 1954 in Oakland, Alameda, California, buried 9 June in Oakland. Husband: William Henry Richardson (birth name), b. 12 Feb 1864 in Campbell, La Crosse, Wisconsin to Squire Freeman Richardson and Caroline E. Devol, moved with his parents to the Stockton, Chautauqua, New York area, worked on the railroad, visited Niagara Falls with his mother where they saw a display of the newly-invented light bulb, m. 1st Maria Agnes Soucier, left his wife and eldest son, began going by his alias William Henry Boyd, listed as a railroad conductor in 1910, working as a brakeman when he lost all but one finger on his right hand, a laundryman in 1922, then worked as a watchman at an onyx mine far out of town (returning home every two weeks), worked and lived in Oakland, Alameda, California after the family moved from Arizona, an especially good and competitive checkers and cards player, made counterfeit silver dollars after moving to California, arrested 19 Feb 1933, indicted by a grand jury 28 Feb 1933 on five counts involving counterfeiting, sentenced 2 Mar 1933 to two years’ imprisonment for counterfeiting, received at McNeil Island Penitentiary in the Puget Sound 5 Apr 1933, released from prison in 8 October 1934 (about six months early), worked for the WPA (as a ratcatcher in Emeryville, Alameda, California (according to son Frank), a laborer at the city hall garage at Emeryville, and a watchman at a curbs and gutters project in Oakland), removed from his WPA project Jul 1936 because he was listed as “Over Age Limit” (Bertha began working for the WPA after his last paycheck was issued in Aug 1936), d. of cardiac failure due to senility 6 May 1955 at the home of his son Frank in San Leandro, Alameda, California, buried next to Bertha May 9 at Evergreen Cemetery, Oakland, Alameda, California. 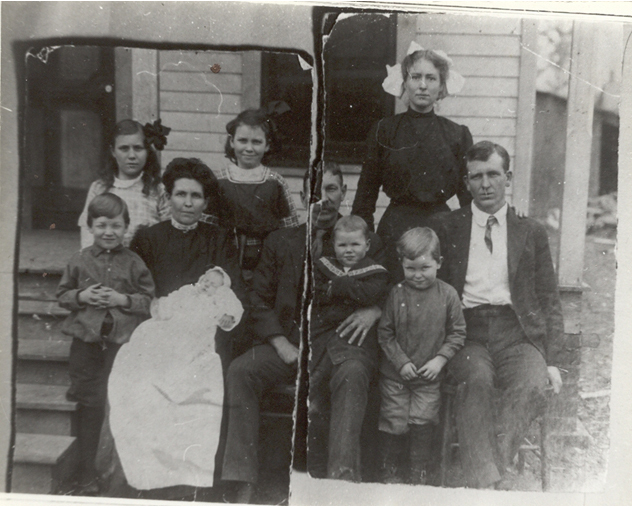 Children: Ellen Margaret Boyd, Kathleen Edith Boyd ("Katie"), Alice Mable Boyd, John Henry Boyd, James William Boyd ("Jim"), Mary Edna Boyd, Julia Ernestine Boyd, and Frank Richard Boyd. Ardella Margaret Brown, born Dec 1880 in Ohio ("infant six weeks old" at the time of her parents' first divorce), married 1) William Chisholm 23 Aug 1902 in Jefferson county, Arkansas (both living in Pine Bluff, Jefferson, Arkansas at the time) and 2) Otho Otholo Eastwood 6 Jun 1903 in Jefferson county, Arkansas (both living in Pine Bluff, Jefferson, Arkansas at the time), living at Merry Green, Grant, Arkansas in 1910, living at Mengelwood, Dyer, Tennessee in about 1918, lived in Civil District 14, Dyer, Tennessee, lived in Cross City, Dixie, Florida with her daughter in 1930, d. 11 Jun 1957 in San Bernardino county, California, buried at Bellevue Memorial Park, Ontario, San Bernardino, California. Husband 1: William Chisholm. No records for him, except for his marriage record, have been found. Husband 2: Otho Otholo Eastwood, b. 7 Jul 1881 in Mengelwood, Dyer, Tennessee, a day laborer at a sawmill in 1910, a skidder foreman (skidding is a process of transporting logs from a cutting site to a landing to be sent to a mill) for Mengel Box Company in about 1918, described as being of a medium build and height with dark hair and gray eyes, a machinist in 1920, d. 1928 in Gadsden county, Florida. Child (by William): William Edison Chisholm (appears in the 1910 census as Chisem Eastwood and in the 1920 census as William C. Eastwood; however, AncestryDNA's ThruLines indicates that I have a DNA connection to a great-grandchild of one "Billie Benitta Chisholm," wife of William Keller and places her as a granddaughter of Ardella. Records indicate that a Billie Beneita Chisholm was the daughter of a William Edison Chisholm, who was born 31 Jan 1903 (see U.S. WWII Draft Cards Young Men, 1940-1947 (card for William Edison Chisholm of Shamrock, Florida); 1940 census, Dixie county, Florida, household of William E. Chisholm; obituary of William Chisholm (Orlando Sentinel (Florida), 3 June 1986); obituary of Billie B. Keller, Orlando Sentinel (Florida), Friday, December 14, 2012; marriage record of William Merle Keller and Billie Beneita Chisholm, Florida Marriage Collection, 1822-1875 and 1927-2001; marriage record of B. E. Chisholm and Mary Spivey, Florida Marriage Collection, 1822-1875 and 1927-2001; gravestone of Billie "Neita" Keller, Greenwood Cemetery, Shamrock, Dixie, Florida). As William Edison Chisholm's birth date is early in the year before Della's second marriage to Otho Eastwood, it is likely that William was the son of Della by her first husband, William Chisholm, that the younger William appeared in the census under his stepfather's name of Eastwood, and that he subsequently went by his birth name of Chisholm.). 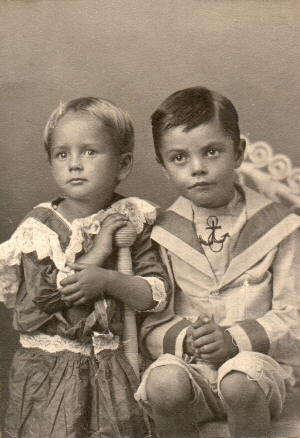 Children (by Otho): Charles Beacher Eastwood (source for his middle name: see Charles Beacher Eastwood in Ancestry.com. U.S. WWII Draft Cards Young Men, 1940-1947 [database on-line]. Lehi, UT, USA: Ancestry.com Operations, Inc., 2011. ), Jackson Eastwood, Garland Eastwood, and Goldie Marie Eastwood. Homer Louis Brown, born 16 May 1882 in Washington, Henry, Ohio (but date given as May 1885 in the 1900 census), living in Pine Bluff, Jefferson, Arkansas at the time of his first marriage, married 1) Susan McKinney 5 Feb 1913 in Jefferson county, Arkansas, probably lived in San Antonio, Bexar, Texas at the end of 1913, a blacksmith helper for United Verde Copper Company who resided in Clarkdale, Yavapai, Arizona in about 1918, described as being of a medium height and stout build with brown hair and brown eyes, married 2) Julia Valenzuela 13 Apr 1932 in Pima county, Arizona, listed as a grocer in Ajo, Pima, Arizona in 1940, a grocer and butcher living in Ajo, Pima, Arizona in 1942, listed as a miner on his death certificate, died 28 Aug 1946 at the Arizona State Hospital in Phoenix, Maricopa, Arizona (had been admitted to the hospital a little less than ten hours before), probably of uremia, buried at Ajo Cemetery, Ajo, Pima, Arizona. 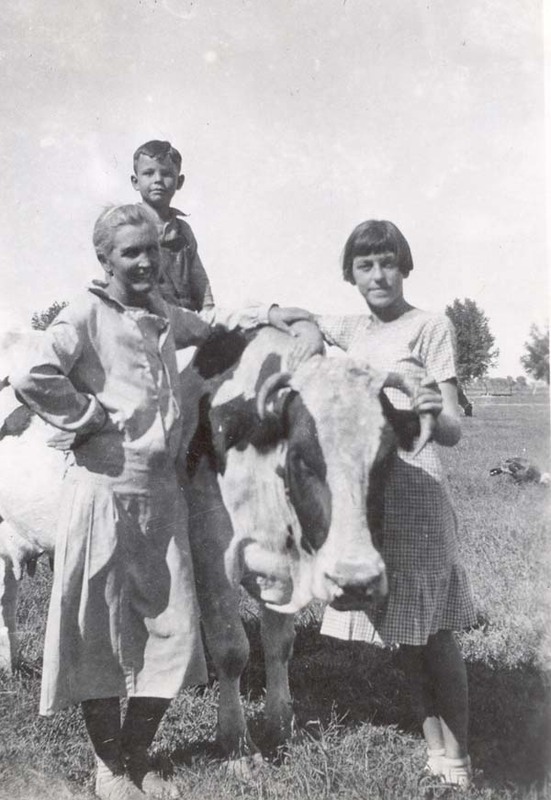 His nephew Frank Boyd, who knew him as a boy and also visited him during World War II, stated that he "had the strength of three or four men" and would, with his brother Jim, wrestle and pick up cows before butchering them. He also clubbed a man to death when the man (who had been in a relationship with Julia before their marriage) showed up drunk and broke into the back of the house. Homer refused to go to police headquarters after that and Frank claimed that they had to bring the court to his house because he was too strong. Frank also stated that he had a strong dislike for hospitals. When he had a kidney infection, he had to be held down and have a knife jabbed in his side to drain the infection. After that, he would have to be placed in a straightjacket before any operation. However, he was strong enough that he could rip the sleeves off the straightjacket, just by straightening his body up. In addition to being the butcher in Ajo, he would take a vegetable cart to the local reservation and sell from his cart and give away homemade ice cream to children. Frank said that his uncle also had a sense of humor and had once told Julia that his mother used to make excellent baked watermelon. The joke backfired, however, when he came home and discovered that Julia had baked a watermelon for him. Despite it being dried up, he ate the watermelon. Wife 1: Susan McKinney, b. abt. 1895, living in Junet, Grant, Arkansas at the time of her marriage. Wife 2: Julia Valenzuela, also called Julia Leon, b. 11 Sep 1911 in Caborca Viejo, Sonora, Mexico, described as 5'2 with a dark complexion, black hair, and brown eyes, d. 1970, bur. with Homer at Ajo Cemetery, Ajo, Pima, Arizona. 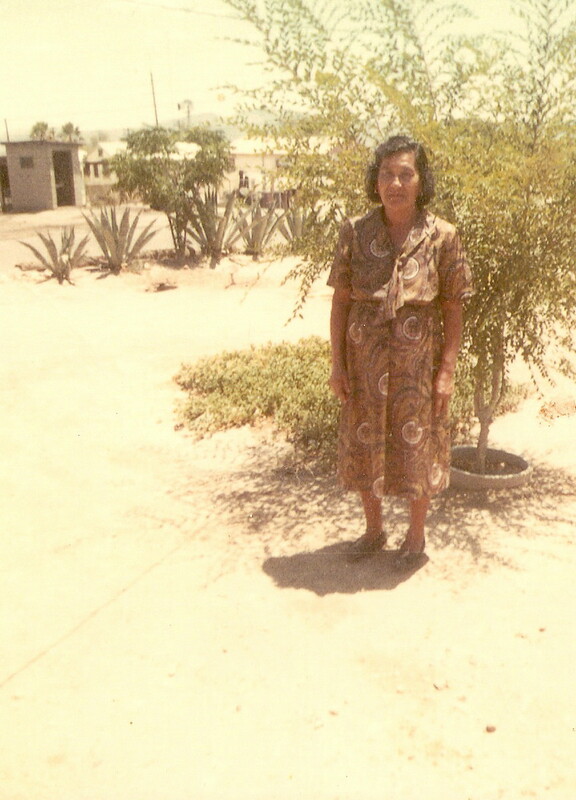 Her parents were Jose Leon Parra and Victoria Romo Ortiz (see 1) border crossing records for Julia Valenzuela de Brown below, 2) 1930 U.S. Federal Census, household of Jose Leon below, and 3) death record for Enrique Leon Romo, son of Jose Leon Parra and Victoria Romo Ortiz, 30 Sep 1982 in Sonoyta, Sonora, Mexico, age 50, from Ancestry.com. Sonora, Mexico, Civil Registration Deaths, 1862-1987 [database on-line]. Provo, UT, USA: Ancestry.com Operations, Inc., 2015. Original data: Mexico. State of Sonora Civil Registration. Registro Civil del Estado de Sonora, México. Courtesy of the Academia Mexicana de Genealogia y Heraldica). Julia, her father, and siblings are listed as "In" (Indian) and her mother as "Mex" (Mexican) in the 1930 census. Under parents' birthplaces, this census notes that Julia's father is full blood and of the "Papago Tribe" (known as the Tohono O'odham Nation, residing in Southern Arizona and Sonora, Mexico) and her mother and all the children are mixed blood and of the same tribe. Children (by Susan): -- Brown (daughter) and Billie Brown (son). Children (by Julia): Homer Joseph Brown (sometimes called Junior; source for middle name: see Homer Joseph Brown in Ancestry.com. U.S., Social Security Applications and Claims Index, 1936-2007 [database on-line]. Provo, UT, USA: Ancestry.com Operations, Inc., 2015. 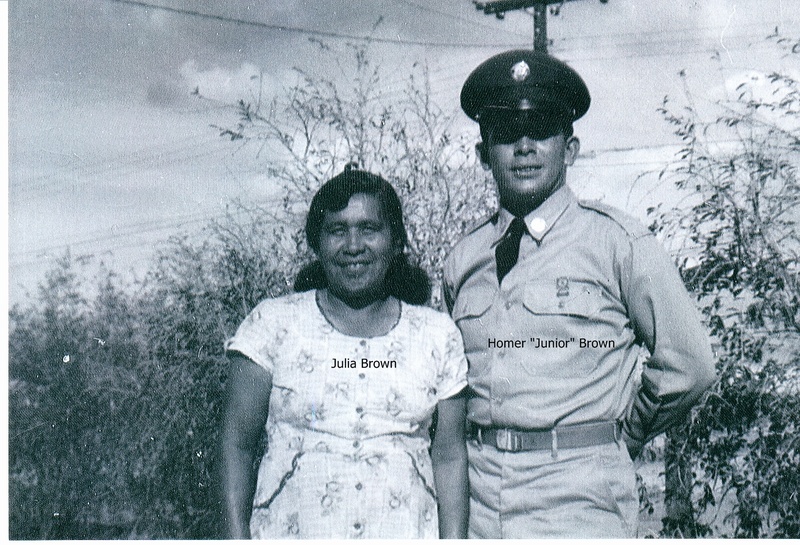 ), Julie Ann Brown (also called Bobbie Julia Brown; killed in the explosion in 1942), Diamond Josephine Brown (died in 1942 but died from a fall from a stopped truck, not the explosion--see Josephine Brown in Ancestry.com. Arizona, Death Records, 1887-1960 [database on-line]. Lehi, UT, USA: Ancestry.com Operations, Inc., 2016. 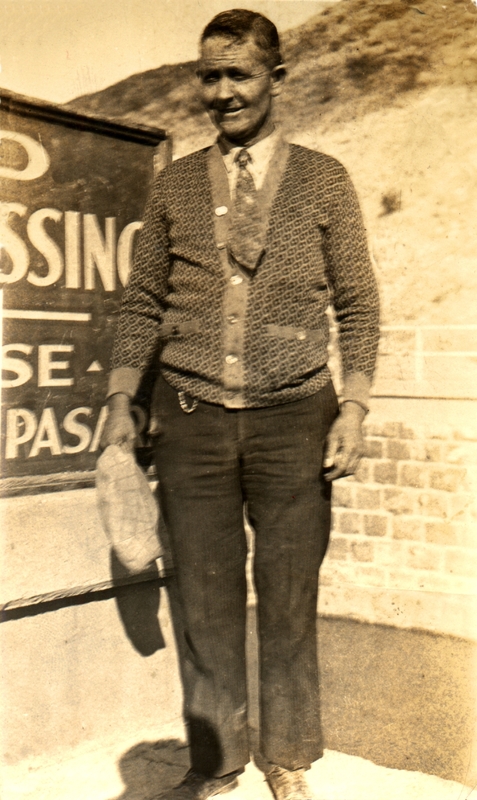 ), Johnnie Brown, Jimmie Brown (killed in the explosion in 1942), and others now living. 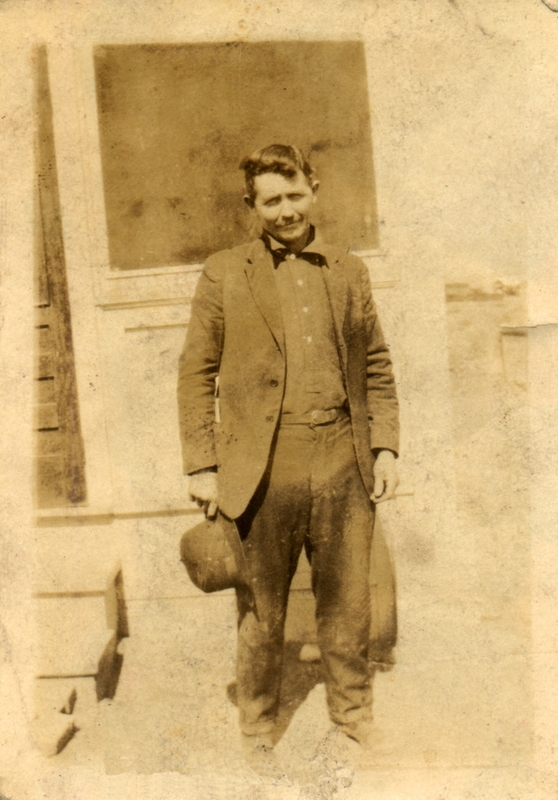 Edward Brown, born Jan 1884 in Arkansas (but it is more likely that he was born in Ohio), died in 1905 in Arkansas (according to family tradition). 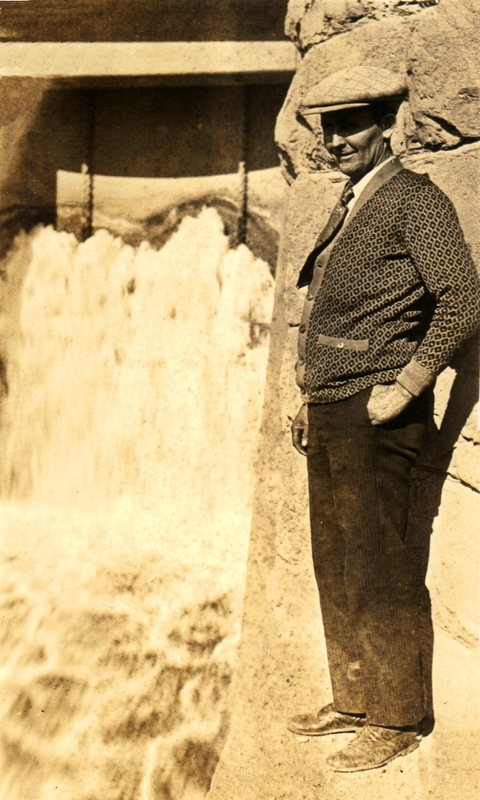 Charles Alva Brown, born 20 Jun 1889 in Hillsdale, Vermillion, Indiana, lived in East Leroy, Calhoun, Michigan in 1929, chauffeur for the Postum Cereal Company (later Post Cereals) in about 1917, described as being of medium height and build with black hair and brown eyes, World War I veteran (enlisted in the army 12 Dec 1917, honorably discharged 28 Jan 1919, a corporal in the Motor Transport Corps 344), married 1) Mary Louise Bisel 15 Jan 1913 in Battle Creek, Calhoun, Michigan (divorced granted 15 Oct 1917 to Mary Louise for extreme cruelty) and 2) Mima Iva Walker (also seen in records as Mina Iva Walker) 11 Feb 1918 in Battle Creek, Calhoun, Michigan, worked as a chauffeur for a food company and lived in Battle Creek with his mother, wife, and baby daughter Geraldine in 1920, a driver for Postum Cereal in Battle Creek in 1921, lived and working as a farm laborer in Athens, Calhoun, Michigan in 1930, accidentally fatally shot his second wife in 1930 (he reportedly propped his gun up after a hunting trip and it fell over and fired), arrested June 1933 for "walking around the street with a loaded shot gun" and firing it once, after "acting queerly for several weeks", arrested 5 Oct 1938 for drunken driving (sentenced to either pay a fine or spend time in jail), fined for being drunk and disorderly 24 Apr 1946, died 3 Mar 1959 in Battle Creek, Calhoun, Michigan, buried at Oak Hill Cemetery, Battle Creek, Calhoun, Michigan. Wife 1: Mary Louise Bisel, b. 18 Oct 1895 in Bellevue, Eaton, Michigan to John Frank and Ella (Crawford) Bisel, m. 2) Albert Bryan Taber (later divorced), a machinist at the time of her second marriage in 1923, m. 3) James G. Nardin, d. Mar 1959, bur. River Bend Cemetery, Walker, Kent, Michigan. Wife 2: Mima (or Mina) Iva Walker, b. 27 Oct 1893 (but gravestone says 1898) in Illinois or Indiana to Rolland B. and Mary (Hammond) Walker, a telephone operator at the time of her marriage, d. 7 Dec 1930 in Barry, Barry, Michigan of a gunshot wound, funeral held 10 Dec 1930, buried at Oak Hill Cemetery. 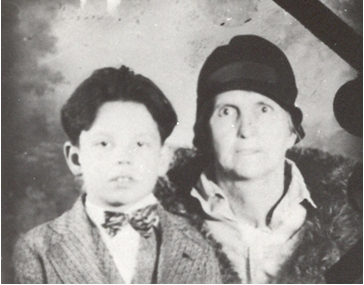 On the afternoon of 6 Dec 1930, Charles returned from hunting with one Gene Fritz to the home of Gene's mother Mildred Fritz at Banfield, Barry, Michigan and leaned his gun against a wall or post. The gun fell and shot Mima in the right leg. She was taken to the hospital at Delton, where she underwent an operation to amputate her leg, but she died 7 Dec at 1:45 am, bur. Oak Hill Cemetery, Battle Creek, Calhoun, Michigan. 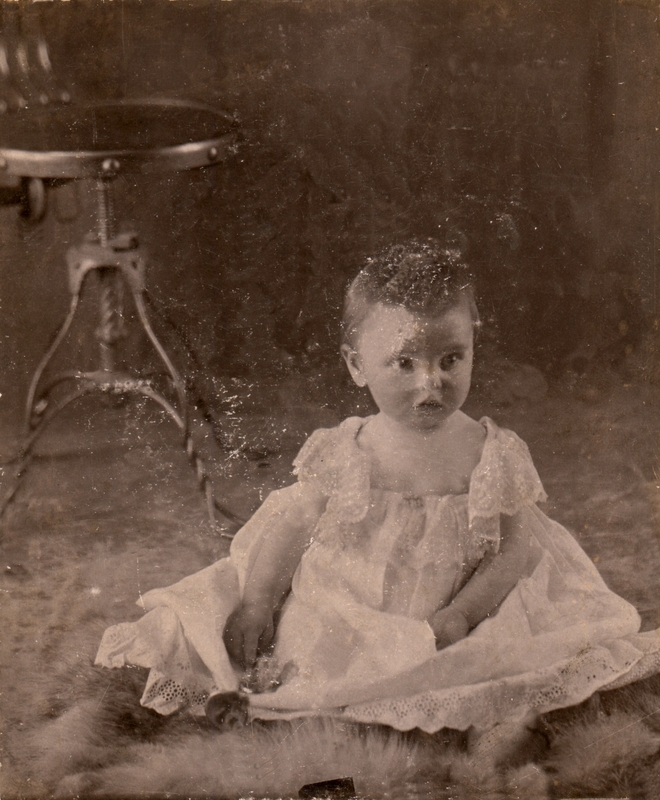 Child (by Mary Louise): Madeline Eloise Brown (source for this child: see her birth record, Ancestry.com. Michigan, Deaths and Burials Index, 1867-1995 [database on-line]. Provo, UT, USA: Ancestry.com Operations, Inc., 2011.). Children (by Mary Louise): Geraldine J. Brown (source for her middle initial: see Geraldine J Anderson in Ancestry.com. U.S., Social Security Applications and Claims Index, 1936-2007 [database on-line]. Provo, UT, USA: Ancestry.com Operations, Inc., 2015.) and Madeline I. Brown (source for her middle initial: see marriage of Manly F Weiderman and Madeline I Brown in Ancestry.com. Michigan, Marriage Records, 1867-1952 [database on-line]. Provo, UT, USA: Ancestry.com Operations, Inc., 2015.). Goldie E. Brown, b. 28 Mar 1891 in Hillsdale, Vermillion, Indiana, married 1) Earl J. Rogers in 1910 in Dowling, Baltimore, Barry, Michigan (later divorced) and 2) Floyd Simeon Moore 16 Jul 1919 in Battle Creek, Calhoun, Michigan (on South Avenue), a saleslady at the time of her second marriage, lived in Albion, Calhoun, Michigan during her marriage to Floyd, divorced from Floyd 11 Sep 1925 at Calhoun county, Michigan (granted to Goldie on grounds of cruelty), married 3) Adna Vail Fuller 23 Jan 1926 in Battle Creek, Calhoun, Michigan, lived in Benton Harbor, Berrien, Michigan in 1929, lived and worked as a saleslady (selling wearing apparel) in Battle Creek, Calhoun, Michigan in 1930, divorced from Adna 24 Jun 1932 (divorce granted to Adna on grounds of extreme cruelty, Goldie banned from marrying for two years and given a restraining order from interfering with Adna and his property in Battle Creek, and an alienation of affections suit by Adna against one Floyd Claggett was settled out of court), living in Payne, Paulding, Ohio at the time of her fourth marriage, lived in Battle Creek in 1935, enumerated as a guest at the Reid Hotel in Flint, Genesee, Michigan and a jewelry demonstrator for a jewelry company in 1940, married 4) Charles V. Shumaker 5 Jul 1941 in Defiance, Defiance, Ohio, lived at Battle Creek, Calhoun, Michigan in 1942, divorced from Charles 7 Jun 1943 at Calhoun county, Michigan, sold jewelry "of her own manufacture" locally and at county fairs for more than 25 years before her death, died 14 Jun 1962 in Battle Creek, Calhoun, Michigan (at her home, 217 West Fountain Street) unexpectedly (though she had been and in a hospital shortly before then), funeral held 16 Jun 1962, buried at Banfield Cemetery, Banfield, Barry, Michigan. Husband 1: Earl J. Rogers, b. 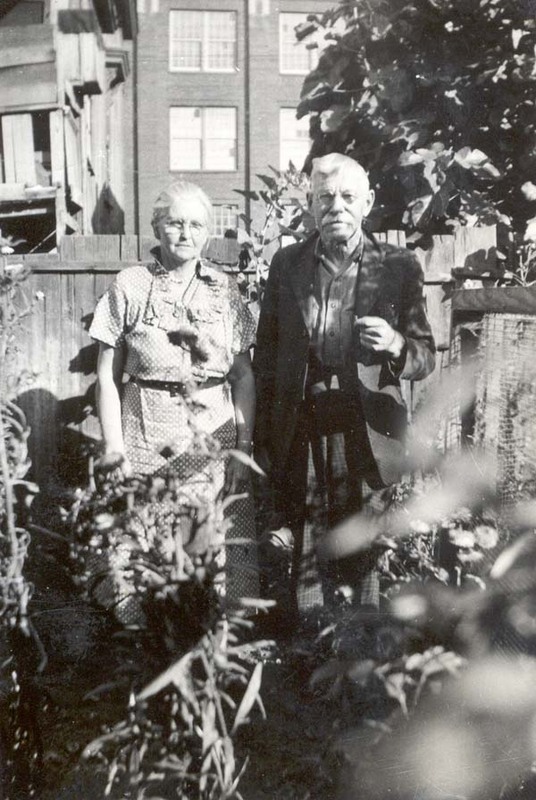 16 Jun 1886 in Lowell, Kent, Michigan to Jehial H. and Sarah (Culver) Rogers, m. 1) Margaret Elizabeth King, a street car conductor in 1910 (also in about 1917 for the Michigan Railway Company), described as being tall and slender with dark brown hair, dark gray eyes, and "Right Thumb off," m. 2) Maude E. Cassady, a teacher at the time of his second marriage in 1919, a milkman at the time of his death, d. 1 Dec 1934 in Freeport, Barry, Michigan ("found dead in his milk truck probably due to heart trouble"), member of Odd Fellows (see emblem on gravestone), buried 5 Dec 1934 in Freeport Cemetery, Freeport, Barry, Michigan. Husband 2: Floyd Simeon Moore, b. 22 Apr 1889 in Rutland, Barry, Michigan to Adelbert and Mary Frances (Huff) Moore, m. 1) Maud Cecil Noble (who died of influenza in 1918), interurban conductor on the Michigan Electric Railway in about 1917 (draft registration) and 1919 (marriage record), described as being slender and of medium height with brown hair and blue eyes, worked for a total of 13 years for Michigan Railway and its predecessor, United Traction, from 1907 to 1920, was still listed as a conductor in the 1920 census, owned a music store at Albion, Calhoun, Mighigan (Moore Music Co.) from 1920 on, member of the three local Masonic lodges, member of the retail committee of the Albion Association of Commerce, m. 3) Hazel I. Winslow, d. 26 Sep 1937 in Albion, Calhoun, Michigan (at the Leisure Hour club, of which he was a member, at 1 am) of a heart attack (angina pectoris), bur. 28 Sep 1937 in Riverside Cemetery, Albion, Calhoun, Michigan, administration on his estate appointed 28 Sep 1937. Husband 3: Adna Vail Fuller, b. 23 Feb 1886 in Battle Creek, Calhoun, Michigan to Adee Vale and Sylvia Anna (Mcardill) Fuller, a fireman for Battle Creek Fire Department (Fire Station #2) in 1918, described as being of medium height and build with brown hair and blue eyes, a real estate broker in 1926, appeared as a real estate salesman in 1930 and 1932, a salesman for R. C. Towsley in Battle Creek in 1931, a private operator in investigation work in 1942, d. Jun 1966, bur. Hicks Cemetery, Pennfield, Calhoun, Michigan. Husband 4: Charles V. Shumaker, b. 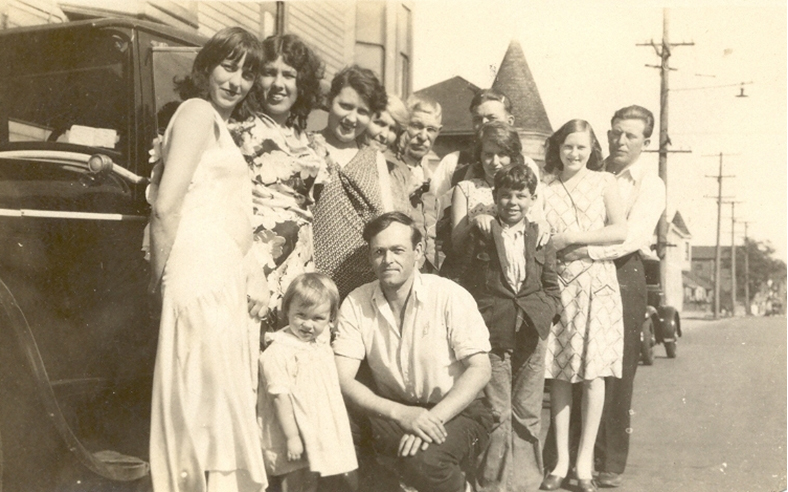 2 Jun 1898 in Fort Recovery, Mercer, Ohio to William E. and Minnie (Hart) Shumaker, m. 1) hazel Prosser (divorced), a machinist at Duplex Printing Press in Battle Creek, Calhoun, Michigan in 1942, m. 3) Zola Laura (Gurnee) (Hine) Mathews (for sources for her name, see 1) marriage of Laura L. Gurnee Hine and Michael Mathews, Ancestry.com. Michigan, County Marriage Records, 1822-1940 [database on-line]. Lehi, UT, USA: Ancestry.com Operations, Inc., 2016., 2) divorce of Arthur Ellsworth Hine and Laura Izola Hine, Ancestry.com. Michigan, Divorce Records, 1897-1952 [database on-line]. 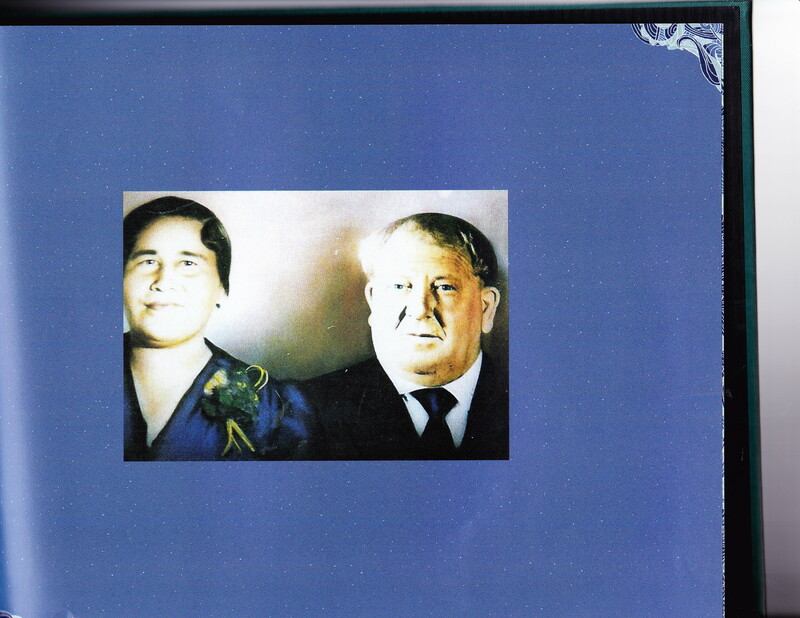 Provo, UT, USA: Ancestry.com Operations, Inc., 2014., and 3) marriage of Zola Gurnee and Arthur E. Hine, Ancestry.com. Michigan, Marriage Records, 1867-1952 [database on-line]. Provo, UT, USA: Ancestry.com Operations, Inc., 2015. 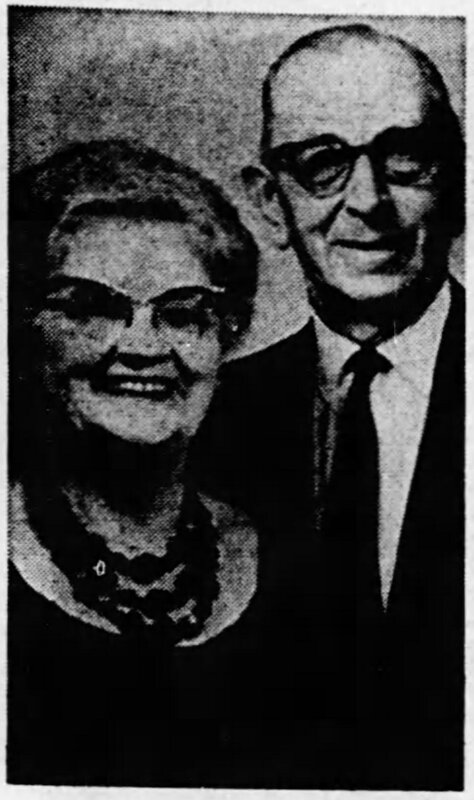 ), a farmer, a spray man at the Charlotte Chair Co., d. 28 Aug 1959 at Charlotte, Eaton, Michigan of a heart ailment, bur. Hillside Cemetery, Kalamo, Eaton, Michigan (with Zola). 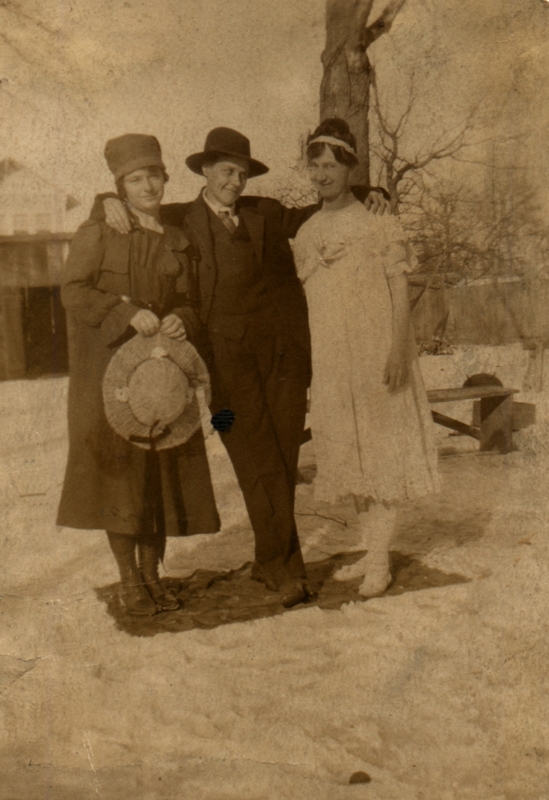 Leona L. Brown, born 10 Mar 1893 in Indiana, worked at a clothing store (Klein's Apparel) before her marriage, also worked at L. W. Robinson Co. (unsure when), married Chauncey Roy Tungate 10 Dec 1913, lived in Banfield, Barry, Michigan for almost ten years after her marriage, moved to Battle Creek, Calhoun, Michigan by 1924, bought a home in Springfield, Calhoun, Michigan with Chauncey in 1950, member (with Chauncey) of the First Congregational Church, member of the Battle Creek Garden Club and the Women's League, was a patient at Kimball Medical Facility for over a year before her death, died 24 Jun 1977 in Kimball Medical Facility, Battle Creek, Calhoun, Michigan, graveside services held 27 Jun 1977, buried with Chauncey at Memorial Park Cemetery, Battle Creek, Calhoun, Michigan. Children: Dorothy Jayne Tungate and Maxwell Allen Tungate (source for his middle name: see Maxwell Allen Tungate in Ancestry.com. U.S., Social Security Applications and Claims Index, 1936-2007 [database on-line]. Provo, UT, USA: Ancestry.com Operations, Inc., 2015.). Ennes, Calvin, A Bit about the Ennes, privately printed manuscript, Au Gres, MI, 1969. Transcription available at http://www.boydhouse.com/darryl/ennis/book/cover.htm, last accessed 8 Jan 2019. Benz, Scott, Town of Elba 175th Anniversary, Genesee County Publications Corp., 1995, pgs.189-190. Interview of Alva Parks and Martha Jane (Ennis) Brown’s grandson, Frank Richard Boyd, Thanksgiving, 1988, interview conducted by Darryl and Alice Boyd; along with handwritten notes of his memories of his family, taken by Alice C. Boyd. Seventh Census of the United States, 1850; (National Archives Microfilm Publication M432, 1009 rolls); Records of the Bureau of the Census, Record Group 29; National Archives, Washington, D.C.
1860 U.S. census, population schedule. NARA microfilm publication M653, 1,438 rolls. Washington, D.C.: National Archives and Records Administration, n.d.
1870 U.S. census, population schedules. NARA microfilm publication M593, 1,761 rolls. Washington, D.C.: National Archives and Records Administration, n.d.
United States of America, Bureau of the Census. Sixteenth Census of the United States, 1940. Washington, D.C.: National Archives and Records Administration, 1940. T627, 4,643 rolls. Information from the probate records of William A. Ennes (29 May 1882, Logan county, Ohio), provided by Ruth Browne (and the Logan County Genealogical Society). 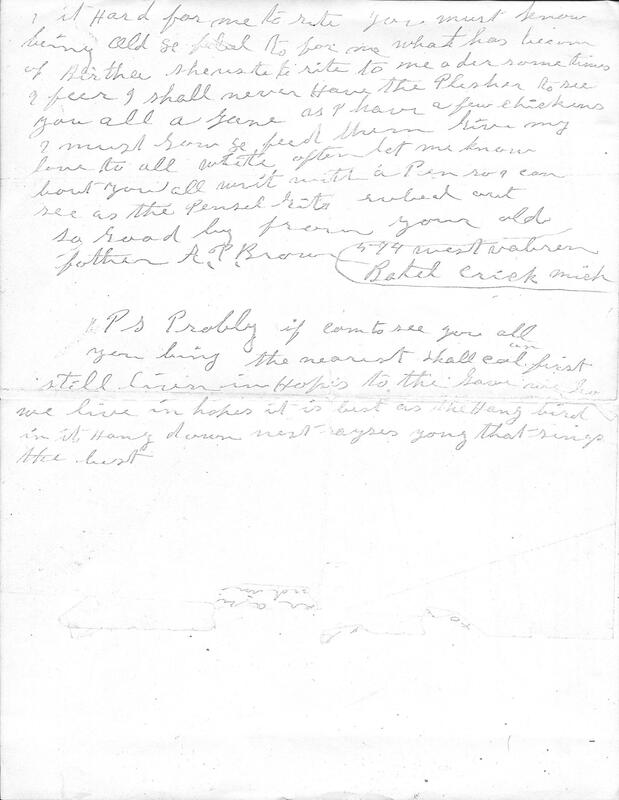 Letter from Alva P. Brown, undated (probably about 1917-8), presumably to one or more of the children of his first marriage, scanned from a photocopy in the possession of Darryl W. Boyd (grandson of Bertha Amanda Brown). Progressive Batavian (Batavia, NY), August 11, 1893. Batavia Daily News (Batavia, NY), 19 April 1920. Democratic Northwest and Henry County News (Napoleon, OH), 18 August 1881, 9 February 1882, 3 January 1884, 5 August 1886, and 7 October 1886. 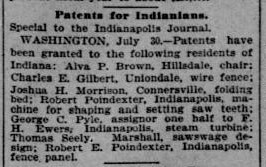 The Indianapolis Journal (Indianapolis, IN), 31 July 1895. Pine Bluff Daily Graphic (Pine Bluff, AR), Wednesday 3 June 1903. Arizona Republic (Phoenix, AZ), Tuesday 8 Jul 1924, Tuesday 5 Aug 1924, Saturday 6 Dec 1924, Friday 18 Dec 1925, and Tuesday 24 Aug 1926. Tucson Daily Citizen (Tucson, AZ), Thursday 28 May 1942 (p. 2)and Friday 29 May 1942, p. 3. Oakland Tribune (Oakland, CA), Monday 20 Feb 1933 (p. 2), Wednesday 1 Mar 1933 (p. 30), and Thursday 2 Mar 1933. Battle Creek Enquirer (Battle Creek, MI), various articles from 16 July 1919 to 26 June 1977. Marshall Evening Chronicle (Marshall, MI), Tuesday 9 December 1930 and Friday 24 June 1932. Albuquerque Morning Journal (Albuquerque, NM), 23 August 1921 and 4 August 1922. Lake, Terry, comp.. San Diego Union-Tribune (California) Obituaries, 1993-1994 [database on-line]. Provo, UT, USA: Ancestry.com Operations Inc, 1999. Krueger, Anne, “The sweet spot of Boulevard,” The San Diego Union-Tribune, November 22, 2005. Certification of Birth, Bertha A. Brown, Washington, Henry, Ohio, Date of record: 13 Jan 1878. Ancestry.com. Michigan, Births and Christenings Index, 1867-1911 [database on-line]. Provo, UT, USA: Ancestry.com Operations, Inc., 2011. Original data: "Michigan Births and Christenings, 1775–1995." Index. FamilySearch, Salt Lake City, Utah, 2009, 2010. Index entries derived from digital copies of original and compiled records. Ancestry.com. Ohio, Births and Christenings Index, 1774-1973 [database on-line]. Provo, UT, USA: Ancestry.com Operations, Inc., 2011. Original data: "Ohio Births and Christenings, 1821-1962." Index. FamilySearch, Salt Lake City, Utah, 2009, 2011. Index entries derived from digital copies of original and compiled records. 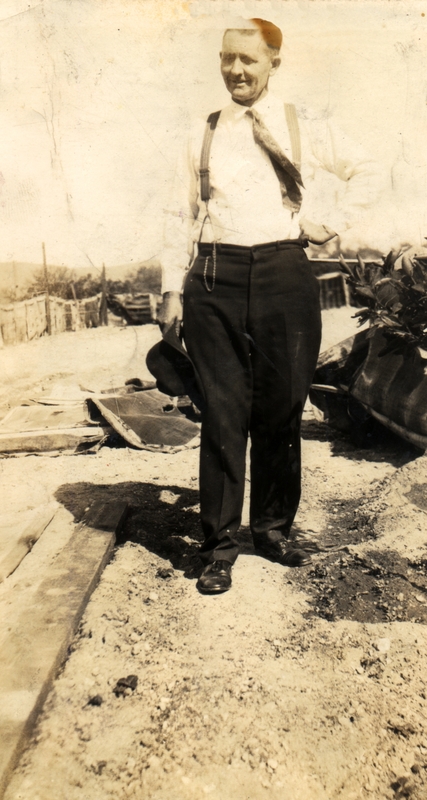 "Arizona Deaths, 1870-1951," database with images, FamilySearch (https://familysearch.org/ark:/61903/1:1:FLV8-7XM : 10 March 2018), Billie Brown, 1925; citing Ajo, Pima, Arizona, reference , Department of Library and Archives, Phoenix, Arizona; FHL microfilm 2,114,562. 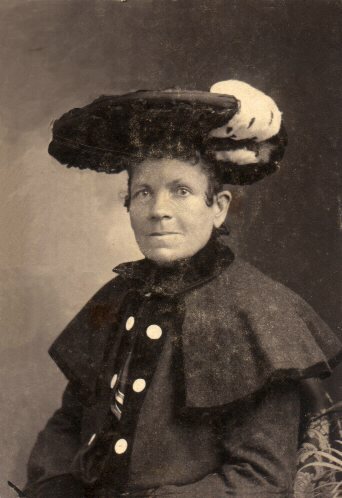 "Michigan Births, 1867-1902," database with images, FamilySearch (https://familysearch.org/ark:/61903/1:1:NQZJ-8XZ : 10 March 2018), Ella Bisel in entry for Mary Louise Bisel, 18 Oct 1895; citing item 2 p 238 rn 427, Bellevue, Eaton, Michigan, Department of Vital Records, Lansing; FHL microfilm 2,322,563. 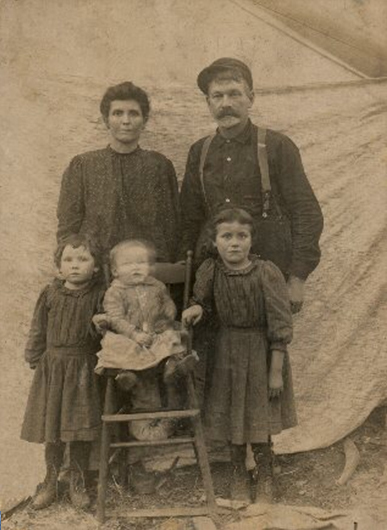 "Michigan Births, 1867-1902," database with images, FamilySearch (https://familysearch.org/ark:/61903/1:1:NQ89-XN1 : 10 March 2018), Sylvia Anna Mcardill in entry for Adna Vale Fuller, 23 Feb 1886; citing item 1 p 375 rn 454, Battle Creek, Calhoun, Michigan, Department of Vital Records, Lansing; FHL microfilm 2,320,843. 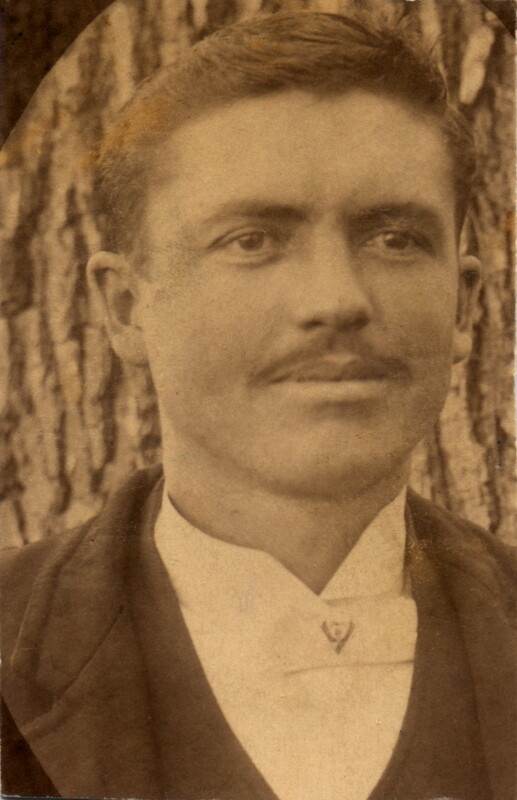 "Michigan Births, 1867-1902," database with images, FamilySearch (https://familysearch.org/ark:/61903/1:1:NQZ1-SVH : 10 March 2018), Ola M. Tungate in entry for Roy C. Tungate, 23 Nov 1886; citing item 2 p 135 rn 766, Johnstown, Barry, Michigan, Department of Vital Records, Lansing; FHL microfilm 2,320,842. 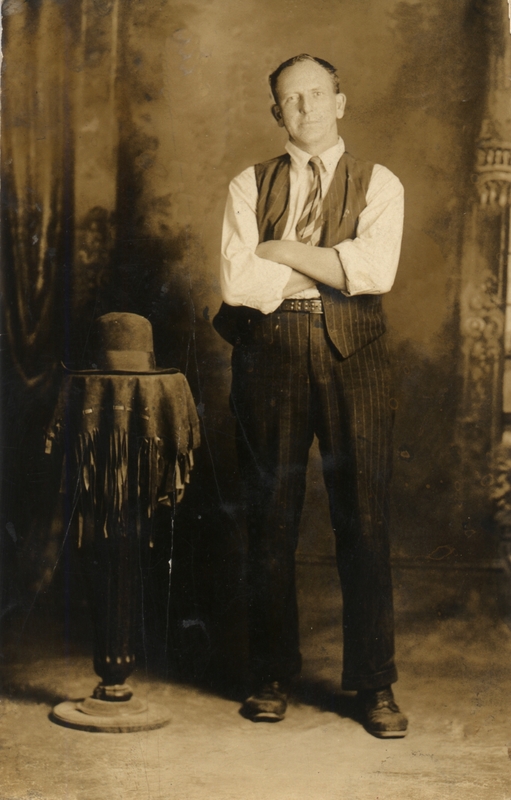 "Texas Birth Certificates, 1903-1935," database with images, FamilySearch (https://familysearch.org/ark:/61903/1:1:XL9Q-8BW : 9 March 2018), Homer Brown in entry for Brown, 21 Dec 1913; citing San Antonio, Bexar, Texas, United States, certificate 40445, Texas Department of Health, Austin; FHL microfilm 4,145,110. Ancestry.com. 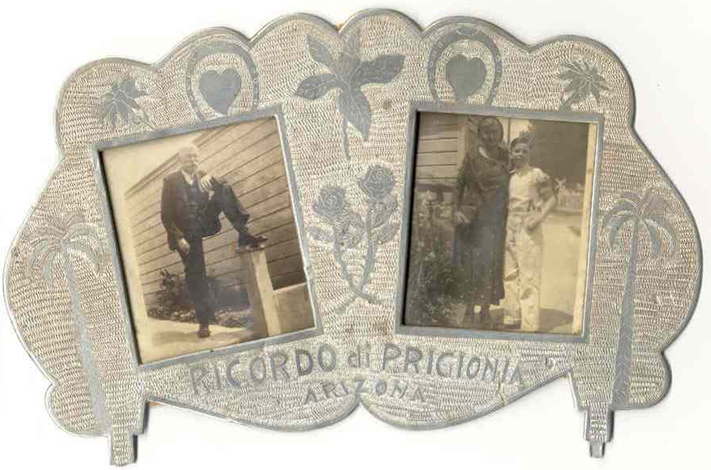 Arizona, Birth Records, 1880-1935 [database on-line]. Provo, UT, USA: Ancestry.com Operations, Inc., 2015. Original data: Arizona Department of Health Services. Arizona Birth Records. Ancestry.com. Ohio, County Marriage Records, 1774-1993 [database on-line]. Lehi, UT, USA: Ancestry.com Operations, Inc., 2016. Original data: Marriage Records. Ohio Marriages. Various Ohio County Courthouses. Ancestry.com. Ohio, Compiled Marriage Index, 1803-1900 [database on-line]. Provo, UT, USA: Ancestry.com Operations Inc, 2001. Original data: Jordan Dodd, Liahona Research. Ohio, Marriages, 1803-1900. Full list of sources in the description. Ancestry.com. Indiana, Select Marriages Index, 1748-1993 [database on-line]. Provo, UT, USA: Ancestry.com Operations, Inc., 2014. Original data: Indiana, Marriages. Salt Lake City, Utah: FamilySearch, 2013. Marriage License and Certificate, William H Boyd and Bertha Ennis, Grady, Lincoln, Arkansas, Date of record: 16 Aug 1897. Ancestry.com. Arkansas, County Marriages Index, 1837-1957 [database on-line]. Provo, UT, USA: Ancestry.com Operations, Inc., 2011. Original data: "Arkansas County Marriages, 1838–1957." Index. FamilySearch, Salt Lake City, Utah, 2009, 2011. "Arkansas County Marriages, 1838–1957," database, FamilySearch; from Arkansas Courts of Common Pleas and County Clerks. Digital images of originals housed at various county courthouses in the State of Arkansas. Marriage records. Ancestry.com. Arizona, County Marriage Records, 1865-1972 [database on-line]. Lehi, UT, USA: Ancestry.com Operations, Inc., 2016. Original data: County Marriage Records. Arizona History and Archives Division, Phoenix, Arizona. Ancestry.com. Michigan, County Marriage Records, 1822-1940 [database on-line]. Lehi, UT, USA: Ancestry.com Operations, Inc., 2016. Original data: Marriage Records. Michigan Marriages. Various Michigan County marriage collections. Ancestry.com. Michigan, Marriage Records, 1867-1952 [database on-line]. Provo, UT, USA: Ancestry.com Operations, Inc., 2015. Original data: Michigan, Marriage Records, 1867–1952. Michigan Department of Community Health, Division for Vital Records and Health Statistics. Ancestry.com. Web: Barry County, Michigan, Marriage Index, 1839-2012 [database on-line]. Provo, UT, USA: Ancestry.com Operations, Inc., 2015. Original data: Web Services. Barry County Clerk. http://internal.barrycounty.org:8081/clerk/web/splash.jsp: accessed 19 March 2012. "Michigan Marriages, 1868-1925", database with images, FamilySearch (https://familysearch.org/ark:/61903/1:1:N32Q-LRM : 15 January 2019), Earl J. Rogers and Goldie E. Brown, 1910. "Michigan Marriages, 1868-1925", database with images, FamilySearch (https://familysearch.org/ark:/61903/1:1:N3VR-8CB : 15 January 2019), Rose Downing in entry for Adna Vail Fuller and Margaret Elizabeth King, 1909. Martha J. Brown v. Alva P. Brown, from Complete Record, Henry Common Pleas, January Term, A.D. 1881, transcription of a photocopy in possession of Darryl W. Boyd. Ancestry.com. Michigan, Divorce Records, 1897-1952 [database on-line]. Provo, UT, USA: Ancestry.com Operations, Inc., 2014. Original data: Michigan. Divorce records. Michigan Department of Community Health, Division for Vital Records and Health Statistics, Lansing, Michigan. Brown, Alva P., Improvement in spring bed-bottoms, US163356A, United States Patent and Trademark Office, 18 May 1875. This patent can be viewed at Google Patents, https://patents.google.com/patent/US163356?oq=alva+brown, retrieved 5 February 2019. Brown, Alva P., Bedstead, US252354A, United States Patent and Trademark Office, 17 Jan 1882. This patent can be viewed at Google Patents, https://patents.google.com/patent/US252354?oq=alva+brown, retrieved 5 February 2019. Brown, Alva P., Chair, US543640A, United States Patent and Trademark Office, 30 Jul 1895. This patent can be viewed at Google Patents, https://patents.google.com/patent/US543640?oq=alva+brown, retrieved 5 February 2019. Ancestry.com. U.S., World War I Draft Registration Cards, 1917-1918 [database on-line]. Provo, UT, USA: Ancestry.com Operations Inc, 2005. Original data: United States, Selective Service System. World War I Selective Service System Draft Registration Cards, 1917-1918. Washington, D.C.: National Archives and Records Administration. M1509, 4,582 rolls. Imaged from Family History Library microfilm. Ancestry.com. U.S., World War II Draft Registration Cards, 1942 [database on-line]. Lehi, UT, USA: Ancestry.com Operations, Inc., 2010. Original data: United States, Selective Service System. Selective Service Registration Cards, World War II: Fourth Registration. Records of the Selective Service System, Record Group Number 147. National Archives and Records Administration. Full Source Citation. Works Progress Administration folders for William Henry and Bertha Boyd, held at National Archives (National Personnel Records Center at St. Louis), photocopies obtained from the archives July 2016. Ancestry.com. Border Crossings: From Mexico to U.S., 1895-1964 [database on-line]. Provo, UT, USA: Ancestry.com Operations, Inc., 2006. Ancestry.com. U.S. General Land Office Records, 1776-2015 [database on-line]. Provo, UT, USA: Ancestry.com Operations Inc, 2008. Original data: United States. Bureau of Land Management, General Land Office Records. Automated Records Project; Federal Land Patents, State Volumes. http://www.glorecords.blm.gov/. Springfield, Virginia: Bureau of Land Management, Eastern States, 2007. California State Library; Sacramento, California; Great Register of Voters, 1900-1968; Roll: Roll 062; Ancestry.com. California, Voter Registrations, 1900-1968 [database on-line]. Provo, UT, USA: Ancestry.com Operations Inc, 2017.Original data: State of California, United States. Great Register of Voters. Sacramento, California: California State Library. Source Information. Ancestry.com. McNeil Island, Washington, U.S. Penitentiary, Photos and Records of Prisoners Received, 1887-1939 [database on-line]. Provo, UT, USA: Ancestry.com Operations Inc, 2008. The Farm Journal Illustrated Rural Directory of Barry County, Michigan, Philadelphia: Wilmer Atkinson Company, 1917, p. 118. 1923 Phoenix, Arizona city directory, photocopy in the files of Darryl W. Boyd. Ancestry.com. U.S., Social Security Applications and Claims Index, 1936-2007 [database on-line]. Provo, UT, USA: Ancestry.com Operations, Inc., 2015. Original data: Social Security Applications and Claims, 1936-2007. Ancestry.com. U.S., Social Security Death Index, 1935-2014 [database on-line]. Provo, UT, USA: Ancestry.com Operations Inc, 2014. Original data: Social Security Administration. Social Security Death Index, Master File. Social Security Administration. Ancestry.com. Michigan, Death Records, 1867-1950 [database on-line]. Provo, UT, USA: Ancestry.com Operations, Inc., 2015. Original data: Death Records. Michigan Department of Community Health, Division for Vital Records and Health Statistics, Lansing, Michigan. Certificate of Death, Bertha Boyd, California, State File No. 54-039040. Certificate of Death, William Henry Boyd, California, State File No. 55-035986. Ancestry.com. Sonora, Mexico, Civil Registration Deaths, 1862-1987 [database on-line]. Provo, UT, USA: Ancestry.com Operations, Inc., 2015. Original data: Mexico. State of Sonora Civil Registration. Registro Civil del Estado de Sonora, México. Courtesy of the Academia Mexicana de Genealogia y Heraldica. Ancestry.com. Arizona, Death Records, 1887-1960 [database on-line]. Lehi, UT, USA: Ancestry.com Operations, Inc., 2016. Original data: Arizona Department of Health Services. Arizona Death Records. Ancestry.com. California, Death Index, 1940-1997 [database on-line]. Provo, UT, USA: Ancestry.com Operations Inc, 2000. Original data: State of California. California Death Index, 1940-1997. Sacramento, CA, USA: State of California Department of Health Services, Center for Health Statistics. Ancestry.com. Florida Death Index, 1877-1998 [database on-line]. Provo, UT, USA: Ancestry.com Operations Inc, 2004. Original data: State of Florida. Florida Death Index, 1877-1998. Florida: Florida Department of Health, Office of Vital Records, 1998. Michigan Department of Vital and Health Records. Michigan, Death Index, 1971-1996 [database on-line]. Provo, UT, USA: Ancestry.com Operations Inc, 1998. Original data: Michigan Department of Vital and Health Records. Michigan Death Index. Lansing, MI, USA. Ancestry.com. U.S., Headstone Applications for Military Veterans, 1925-1963 [database on-line]. Provo, UT, USA: Ancestry.com Operations, Inc., 2012. Original data: Applications for Headstones for U.S. Military Veterans, 1925-1941. Microfilm publication M1916, 134 rolls. ARC ID: 596118. Records of the Office of the Quartermaster General, Record Group 92. National Archives at Washington, D.C.
Gravestone of Alva P. and Louisa A. Brown and Goldie E. (Brown) Shumaker, Banfield Cemetery, Banfield, Barry, Michigan. Gravestone of Earl J. and Maude E. Rogers, Freeport Cemetery, Freeport, Barry, Michigan. Gravestone of William H. and Bertha A. (Brown) Boyd (with daughter Kathleen and son-in-law Frank Willis), Evergreen Cemetery, Oakland, Alameda, California. Plaque in mausoleum for Ordella M. Eastwood, Bellevue Memorial Park, Ontario, San Bernardino, California. Gravestone of Homer Louis and Julia (Valenzuela) Brown and some of their children (Johnnie, Julie Ann, Josephine, and Jimmie), Ajo Cemetery, Ajo, Pima, Arizona. Gravestones of James E. and Luz Brown, Greenwood Memorial Park, San Diego, San Diego, California. Gravestone of Ada Ennes, Hot Springs Cemetery, Truth or Consequences, Sierra, New Mexico. Gravestone of Charles Alva Brown, Oak Hill Cemetery, Battle Creek, Calhoun, Michigan. Gravestone of Chauncey R. and Leona L. Tungate, Memorial Park Cemetery, Battle Creek, Calhoun, Michigan. Gravestone of Louise Nardin, River Bend Cemetery, Walker, Kent, Michigan. Gravestone of Floyd S. Moore, Riverside Cemetery, Albion, Calhoun, Michigan. Gravestone of Adna Vail Fuller, Hicks Cemetery, Pennfield, Calhoun, Michigan. Gravestone of Charles V. and Zola L. Shumaker, Hillside Cemetery, Kalamo, Eaton, Michigan. For more information about these photos, click here for a PDF. Alonzo Havington Ennes, eldest son of William and Margaret Snell Ennes was born at Schenectady, York State, November 17, 1819. In 1834 he moved with his parents to what later became York Center, York township, Union County, Ohio. Here at the age of sixteen, he taught school and helped his father clear land. On September 19, 1846, Alonzo H. Ennes married Olive Bird in Union County. Rev. D. Dudley performed the ceremony. Olive Bird's parents came from York State in 1819, to Cuyahoga County, Ohio, near Cleveland. There they lived for several years. Then they moved to Logan County, Ohio, where on November 17, 1827, Olive was born. She was an only daughter in a large family of boys. In 1839, the Bird family moved from Logan County to a farm in Washington township in Union County, Ohio, about five miles southeast of Mount Victory. Here the family grew. Many Birds served, and two died as Union soldiers in the Civil War. 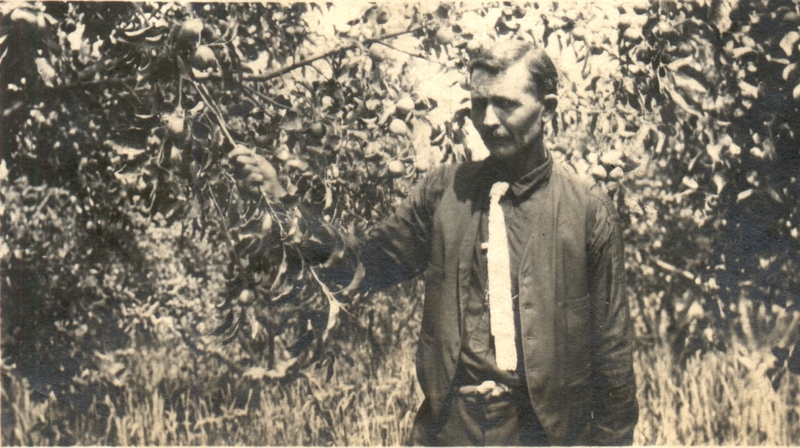 One of Olive Bird's brothers, Gorham, became one of Union County's prominent citizens. They then moved to Henry County in February 1865, where Sarah Olive Ennes was born September 11 of that year. In the 1860's, Texas Henry County, Ohio was a thriving village with mills and factories. Texas was located on the Miami and Erie Canal which ran from Toledo to Cincinnati. It was about 25 miles up the Maumee River from Toledo. Here on April 14,1865, Alonzo Havington Ennes and wife Olive purchased 204 acres for $7000.00 cash from Buel G. Fish and his wife Eliza according to the records in the office of register of deeds, in volume 11, page 309, at Napoleon, Ohio. On this property in Washington township, north of the Canal and bordering Texas on the east, Alonzo and his wife Olive lived and died. Olive Ennes and her baby died here in childbirth on the sixth of June, 1869, at age of 41. It is said that her death inspired her son, Lincoln, who was only 9 at the time to become a doctor for there were no doctors available at his mother's death. As a result, Lincoln graduated from two of America's medical schools, Michigan and Long Island College of Medicine. Alonzo Havington Ennes died Jan. 6, 1879. On New Years Day that year while butchering hogs, he cut his hand and blood poisoning set in. Doctor Hag was out of town. His son Lincoln was in medical school and no other doctors were available. In his teens, Alonzo became an Advent, a faith which he and several of his children followed all their lives. Alonzo was liberal in his belief. He not only kept the Sabbath Day holy, but he kept Sundays holy also. He would not do anything nor permit any members of his household to do anything on Sunday that would disturb people of other faiths. There was no Advent Church at Texas. His daughter Sarah tells how they used to worship. On Saturdays in the afternoon, Alonzo Ennes gathered his family in front of the fireplace in the big dining room. There, by the fireplace light, if it were cold, or by candle light if it were warm, (Alonzo never had a lamp in the house) he would read from the Old Ennes Bible, which had been handed down from generation to generation since the three sons left the Erne River Valley in Ireland nearly 200 hundred years before. After reading a passage from the Bible, they had a short prayer after which, if the weather was nice he took the children in the woods. Although there were no newspapers, Alonzo read many books, all by candlelight. He made the woods and outdoors interesting to his children by his nature stories. One of the books owned and read by him was "The Life of Abraham Lincoln" of whom he was an ardent admirer. The book, published before Lincoln's death is now in the possession of Mrs. Mary Wilkins, one of his grandchildren. When the Community Church was built at Texas, Sarah Ennes stated that Alonzo Ennes was instrumental in getting the church finished by giving a large contribution towards its completion. Although always an Advent by faith, he wanted other churches to thrive. Alonzo Ennes was an ardent worker. It is said that during the busy season, he never took the harnesses off of the horses that worked his large farms. He had his children work in the fields too, with him. At mealtime he usually sent Sarah and the younger children to the house to get meals ready while he and the older children remained in the fields, for their mother was dead. The Alonzo Ennes farms at Texas had rich soil. The valleys along the streams running through them were heavily forested with large black walnut, shagbark hickory and sycamore trees. These woods were a squirrel-hunters paradise because of the many nuts. The large barn on the Alonzo Ennes Farm was about eight rods north from the Canal. Between the barn and the house was a large garden and an orchard of apple, peach and quince trees. The large farmhouse had a large basement. South of the house next to the garden, was a large granary. Next to the granary was a horse-powered treadmill used to run a large fanning mill next to the granary. In those days the grain was cut by scythe or cradles, bound into sheaves, hauled in, then stacked near the fanning mill. There the grain was thrown on hard ground and trampled by a team of horses going round and round in a circle. It was then flailed with heavy sticks tied together with raw hides. Then the chaff and grain was thrown into the horse-powered fanning mill which blew the chaff and the straw from the grain. The grain was stored in the large granary until it was hauled to the gristmill which was located at the Canal Lock at Texas. There it was ground into flour and feed. The gristmill burned about 1894. Those were busy days for the girls on the Old Ennes Farm. They not only did the housework and work in the fields but they made the hundreds of tallow candles needed for lighting the home, and also those used in the many square-tinned lanterns used in the barns and stables. The girls also made the lard and the apple butter over an open fire in a large iron kettle outdoors. In fact, they made nearly everything except the shoes they wore on their feet. Over the years, Alonzo bought many farms so the Alonzo Ennes Farm at Texas, Ohio was originally composed of many smaller places with buildings on each of them. These farms were located north of the Canal on the east side of Texas. After Alonzo's death in 1879, each of his children, with the exception of Lincoln, who had been given money for his medical education, was given a portion of his holdings. Ordella, his eldest daughter, who married David Bowker, died in 1871. Martha Brown, with her large family inherited the Alonzo Ennes home, buildings and land where she and the Ennes family had lived. 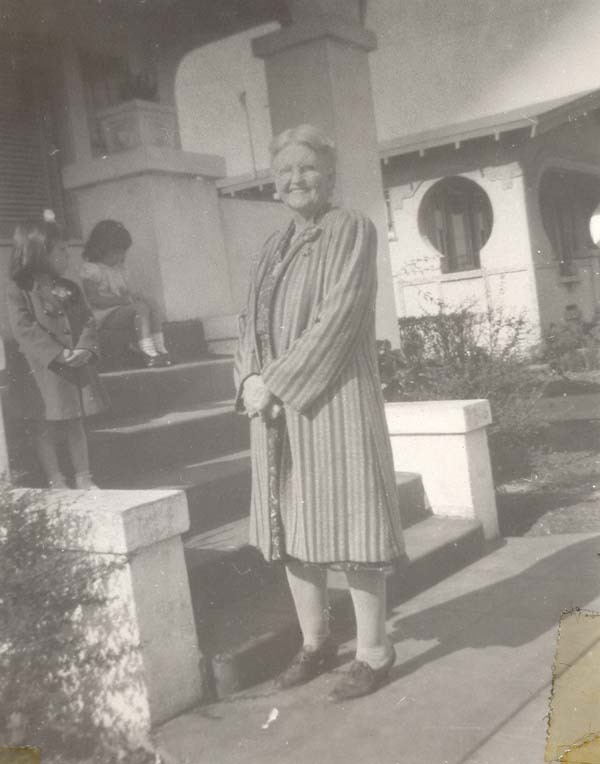 Ellen Hanchett received and lived on the Ennes farm between Martha's and the village of Texas. Amanda Bellinger was given the farm east and north of the Paddy McGrain Place. The Bellingers sold their property and moved to Findlay, Ohio when the oil boom hit there. Lincoln Garibaldi Ennes was given money for his medical education in lieu of a farm. Sylvester Beecher Ennes inherited the place between the Old Ennes Farm and Sarah Olive Miller farm which east of Paddy McGrain Place. Sylvester lived on this Ennes place during 1890-1893, then moved to the Ennes farm east of the Old Ennes farm bordering Miami and Erie Canal's Wide water on the north. 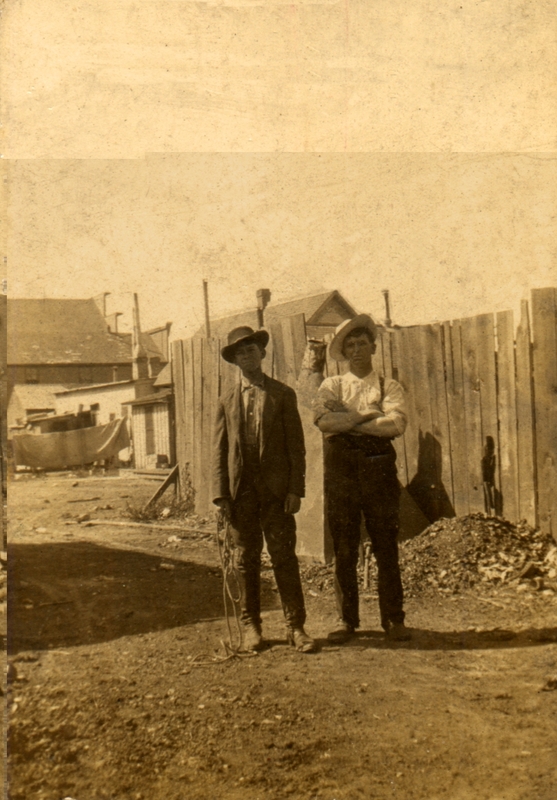 There, he and his family lived until 1896 when he sold it and moved to Au Gres, Michigan." MARTHA JANE ENNES married Albert Brown. 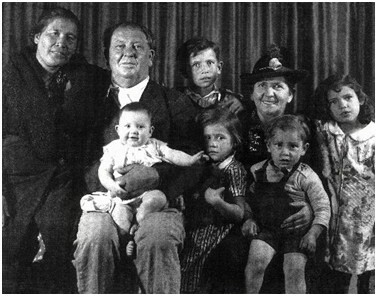 They had five children, three boys and two girls. Albert Brown was a salesman. He ran a huckster wagon to County Fairs and door to door selling things like spring seats, water pumps and hundreds of items in demand then. Young Sylvester Beecher Ennes traveled with Albert on his many trips. It was a hard life for them and a harder life for Martha, his wife, who lived with her father at the Old Ennes Farm taking care of her children. After Ordella died in 1871, Martha was the oldest. Alonzo Ennes gave her the Old Family Bible. Shortly after her father Alonzo died in 1879, Martha left Brown, took her family, the Bible, which had the Ennes family records back to 1666 in Ireland, few belongings and went to Arkansas. On the way the boat was wrecked while on the Mississippi. The Bible and her belongings were lost, but the family survived. Several years later she came back to Texas with her youngest son Edward and visited. She was never heard from again after she returned to Arkansas. Source: Ennes, Calvin, A Bit about the Ennes, privately printed manuscript, Au Gres, MI, 1969. Transcription available at http://www.boydhouse.com/darryl/ennis/book/cover.htm, last accessed 8 Jan 2019. 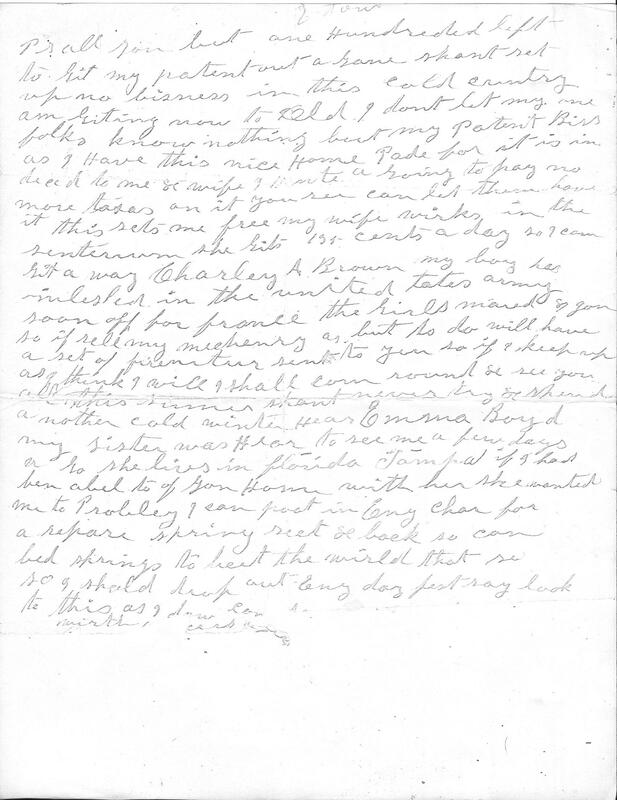 Source: Letter from Alva P. Brown, undated (probably about 1917-8), presumably to one or more of the children of his first marriage, scanned from a photocopy in the possession of Darryl W. Boyd (grandson of Bertha Amanda Brown). Frances Davis Daughter Bradner, Wood Co., O.
Priscilla Brooks Daughter Lexington, McClain Co. Ill.
Ellen Elliot Daughter Carolton, Caroll Co., Ia. 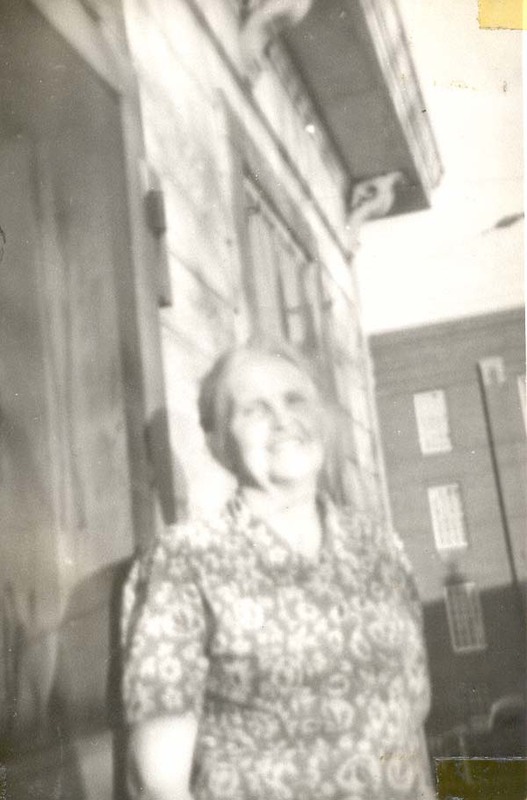 Maggie M. Southard Daughter West Mansfield, Logan Co., O.
Lorenzo D. Ennes Dec'd: Having a Son Guar. In Union Co., O. Source: Information from the probate records of William A. Ennes, provided by Ruth Browne (and the Logan County Genealogical Society). Orsemus Brown, formerly a well-known citizen of Elba, died at the residence of his son, T. D. Brown, of Canandaigua, Aug. 7th, aged 83 years. He was born in Oneida county, N. Y., in 1810; and at the age of ten years was left an orphan, his father having been murdered and robbed. Calvin Brown, a well-known pioneer settler in Elba, took Orsemus to his home and reared him up to manhood. Jan 1st, 1838, he united in marriage with Miss Diantha Park, of Elba, a woman of remarkable energy and enterprise. This union was blessed with five children, all of whom are living. 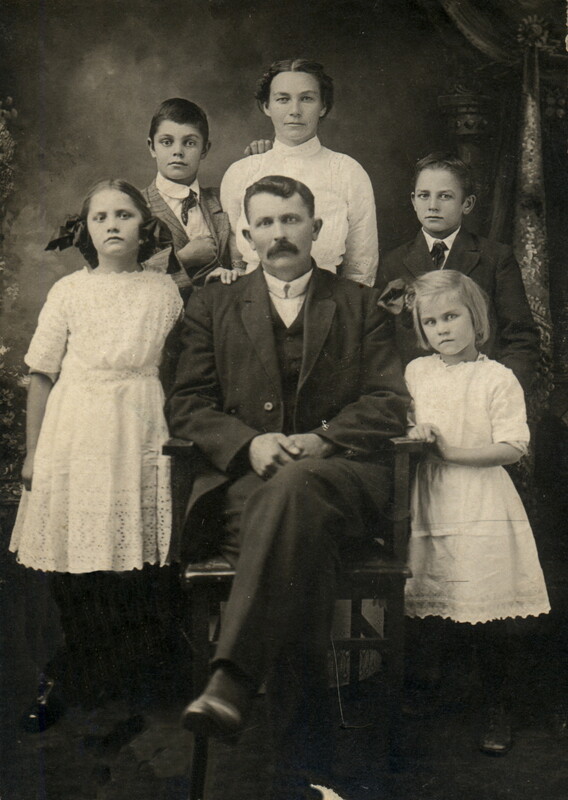 T. D. Brown, of Canandaigua; Alva P. Brown, of Southern Indiana; George W. Brown, of Michigan; Franklyn C. Brown, of Little Sioux, Iowa; and Mrs. Emma J. Boyd, of North Dakota. And it is not a little remarkable that no death occurred in the family until in February last when Mrs. Brown, the devoted wife and mother, died. 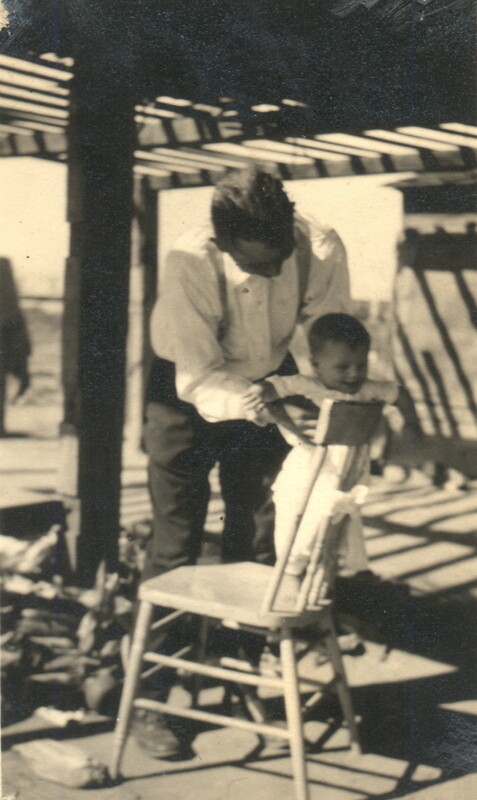 For a number of years, Mr. Brown has been in poor health and for a time he was entirely helpless, but was entirely cared for by his son, T. D. Brown. His remains reached Elba Tuesday evening and were laid in the old cemetery by the side of his companion and other relatives. The brief service at the grave was by his former pastor, Rev. E. A. Wheat. Source: Progressive Batavian (Batavia, NY), August 11, 1893. Source: Batavia Daily News (Batavia, NY), 19 April 1920. Source: Democratic Northwest and Henry County News, Napoleon, OH, 18 August 1881. Source: Democratic Northwest and Henry County News, Napoleon, OH, 9 February 1882. Source: Democratic Northwest and Henry County News, Napoleon, OH, 3 January 1884. Source: Democratic Northwest and Henry County News, Napoleon, OH, 5 August 1886. Source: Democratic Northwest and Henry County News, Napoleon, OH, 7 October 1886. Source: The Indianapolis Journal, Indianapolis, IN, 31 July 1895. Available at Chronicling America (Library of Congress). Source: Pine Bluff Daily Graphic (Pine Bluff, AR), Wednesday 3 June 1903. Source: Ad for watermelons, Arizona Republic (Phoenix, AZ), Tuesday 8 Jul 1924. Source: Ad for melons, Arizona Republic (Phoenix, AZ), Tuesday 5 Aug 1924. 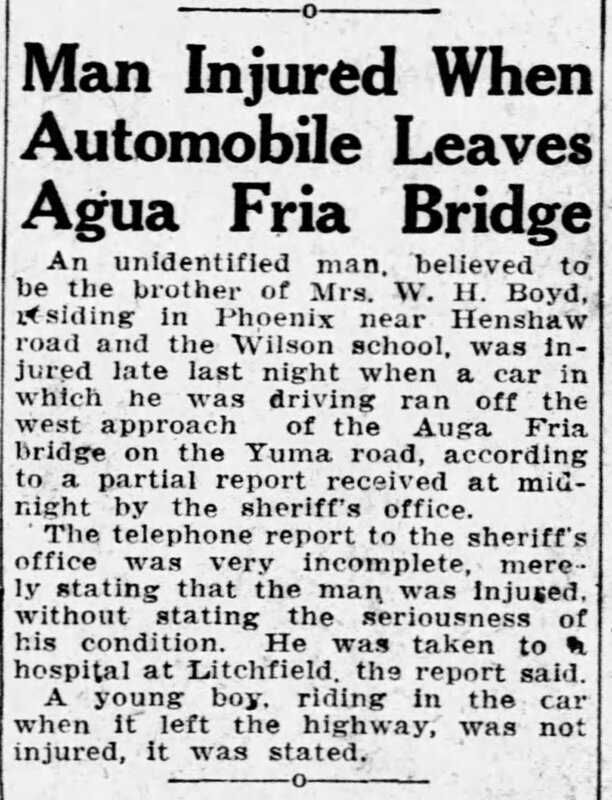 Source: "Man Injured When Automobile Leaves Agua Fria Bridge," Arizona Republic (Phoenix, AZ), Saturday 6 Dec 1924. Source: Ad for hens, Arizona Republic (Phoenix, AZ), Friday 18 Dec 1925. Source: "Sentence Suspended," Arizona Republic (Phoenix, AZ), Tuesday 24 Aug 1926. 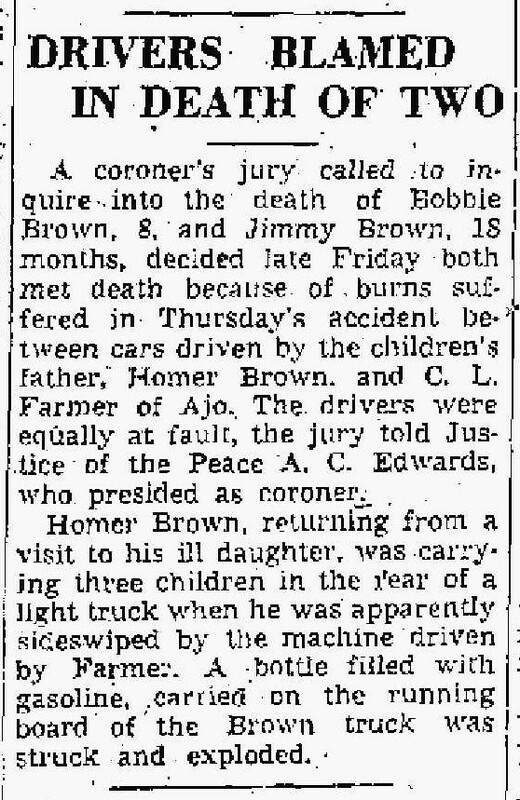 Source: "Two Children Burned to Death at Ajo," Tucson Daily Citizen (Tucson, AZ), Thursday 28 May 1942, p. 2. Source: "Drivers Blamed in Death of Two," Tucson Daily Citizen (Tucson, AZ), Friday 29 May 1942, p. 3. 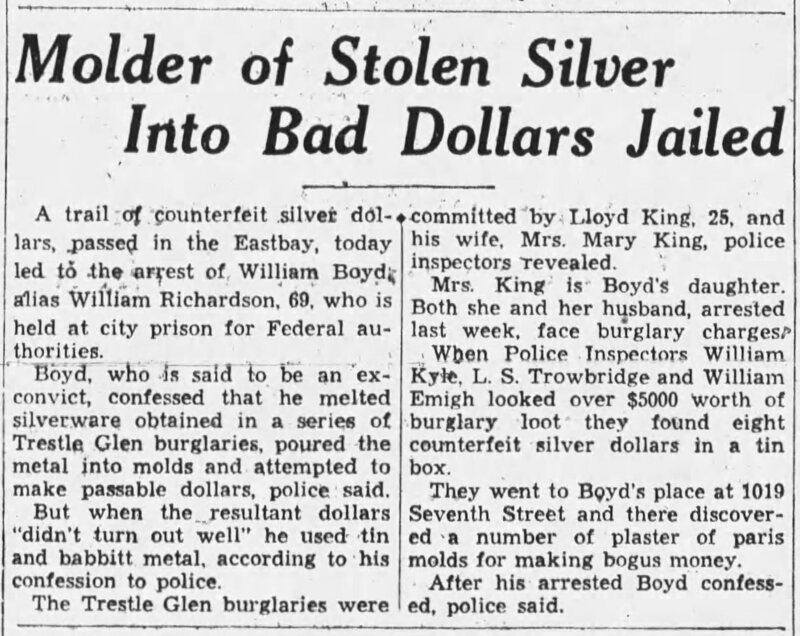 Source: "Molder of Stolen Silver into Bad Dollars Jailed," Oakland Tribune (Oakland, CA), Monday 20 Feb 1933, p. 2. 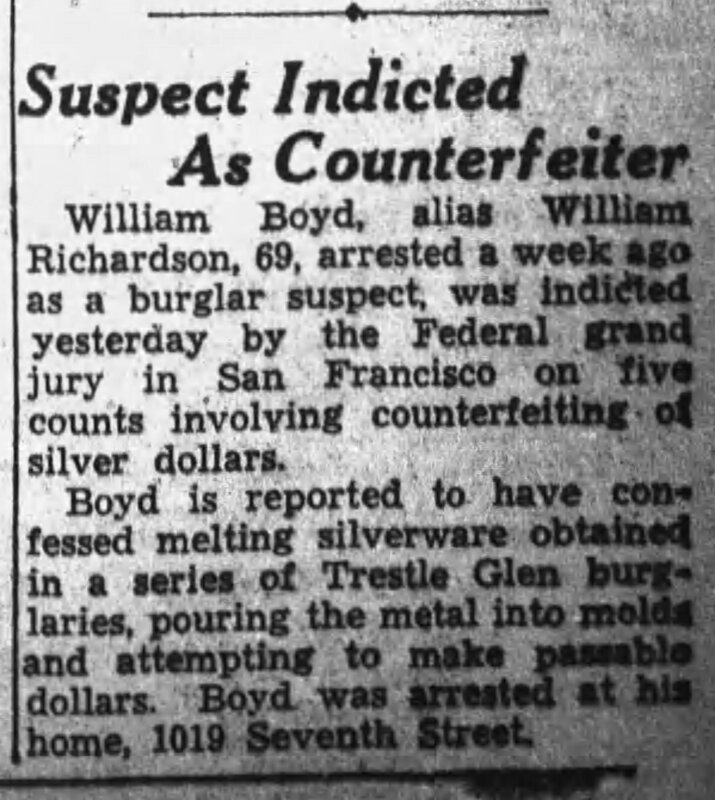 Source: "Suspect Indicted as Counterfeiter," Oakland Tribune (Oakland, CA), Wednesday 1 Mar 1933, p. 30. Source: "Holiday Slows Down Courts," Oakland Tribune (Oakland, CA), Thursday 2 Mar 1933. 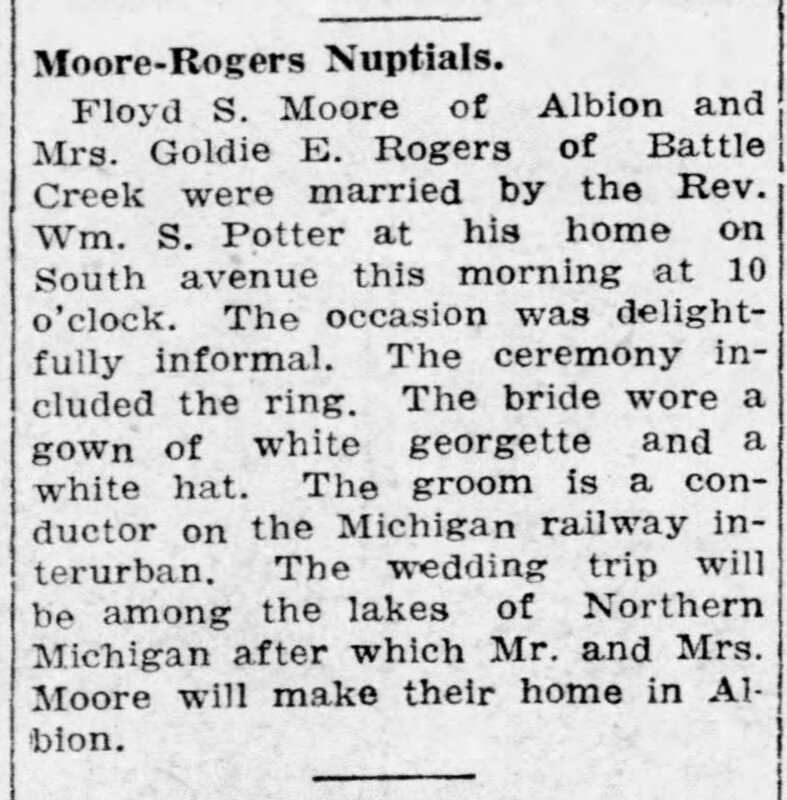 Source: "Moore-Rogers Nuptials," Battle Creek Enquirer (Battle Creek, MI), Wednesday 16 July 1919. 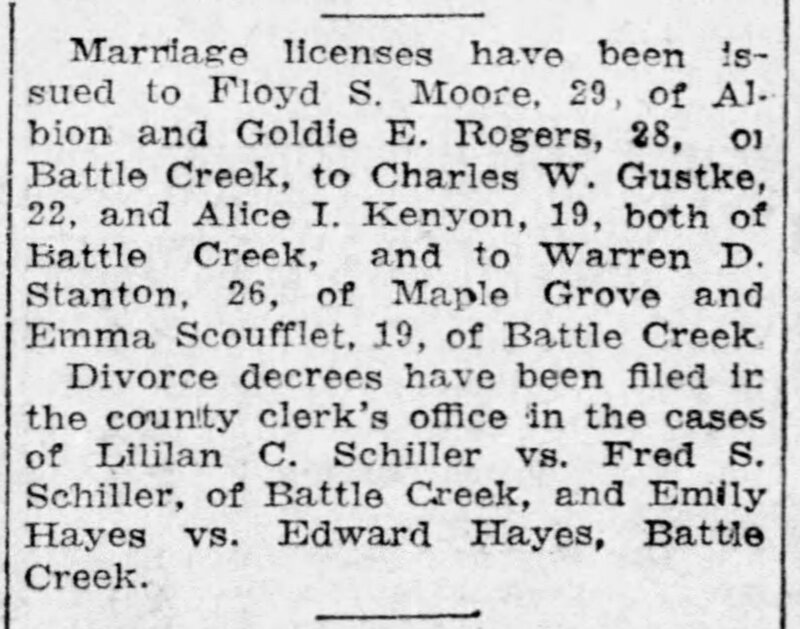 Source: Notices of marriage licenses, Battle Creek Enquirer (Battle Creek, MI), Wednesday 16 July 1919. Source: Notice of the Tungates visiting the Moores, Battle Creek Enquirer (Battle Creek, MI), Sunday 24 December 1922. 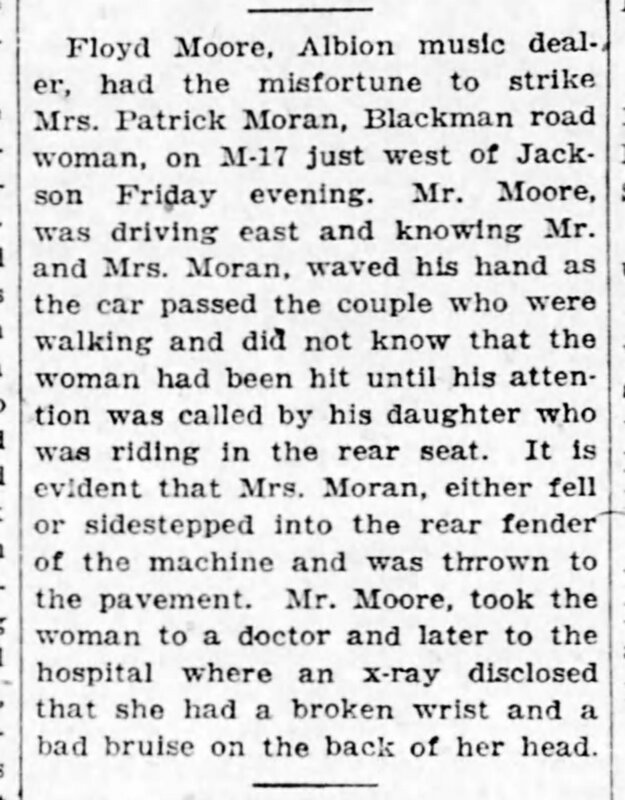 Source: "Man Struck by Woman Driver," Battle Creek Enquirer (Battle Creek, MI), Sunday 22 July 1923. Source: "Daughter Extending Visit," Battle Creek Enquirer (Battle Creek, MI), Tuesday 29 July 1924. Source: Report of a woman accidentally hit by a car, Battle Creek Enquirer (Battle Creek, MI), Saturday 18 July 1925. Source: "Decrees Granted," Battle Creek Enquirer (Battle Creek, MI), Friday 1 September 1925. 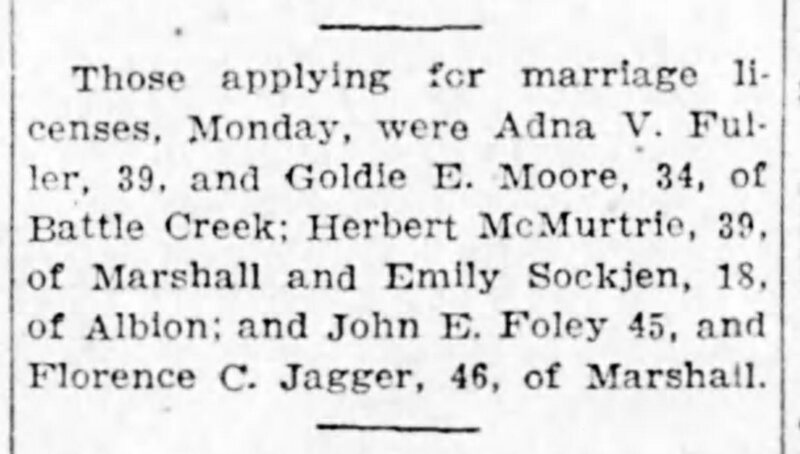 Source: Notices of those applying for marriage licenses, Battle Creek Enquirer (Battle Creek, MI), Tuesday 19 January 1926. 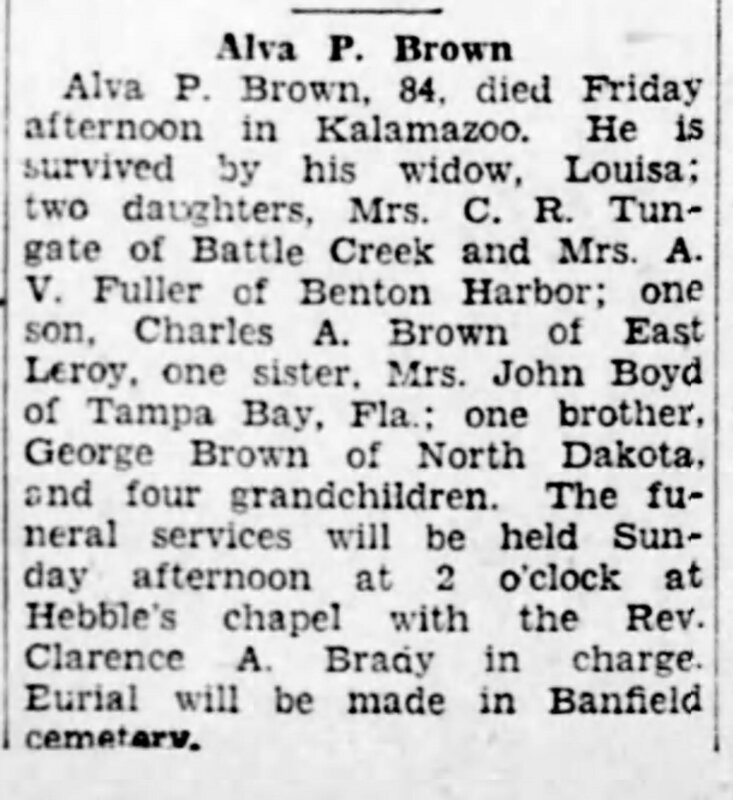 Source: Obituary of Alva P. Brown, Battle Creek Enquirer (Battle Creek, MI), Saturday 15 June 1929. Source: "Wife of Hunter is Fatally Shot When Gun Slips," Battle Creek Enquirer (Battle Creek, MI), Monday 8 December 1930. 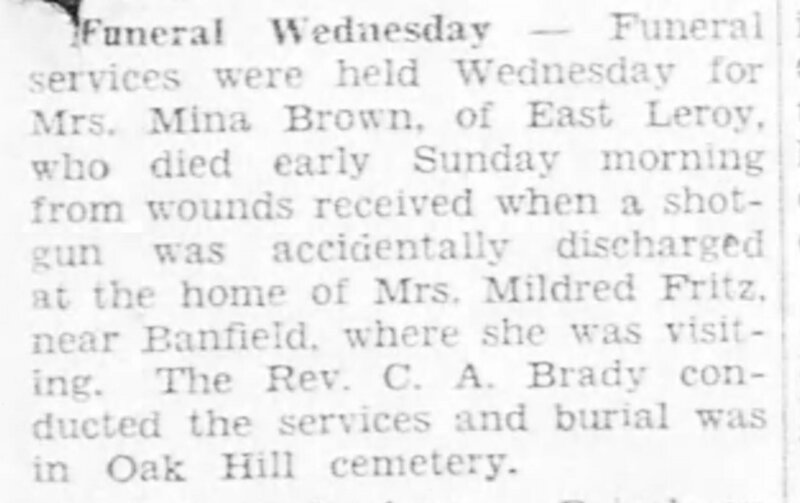 Source: "Services for Gunshot Victim are Wednesday," Battle Creek Enquirer (Battle Creek, MI), Tuesday 9 December 1930. Source: "Funeral Wednesday," Battle Creek Enquirer (Battle Creek, MI), Thursday 11 December 1930. 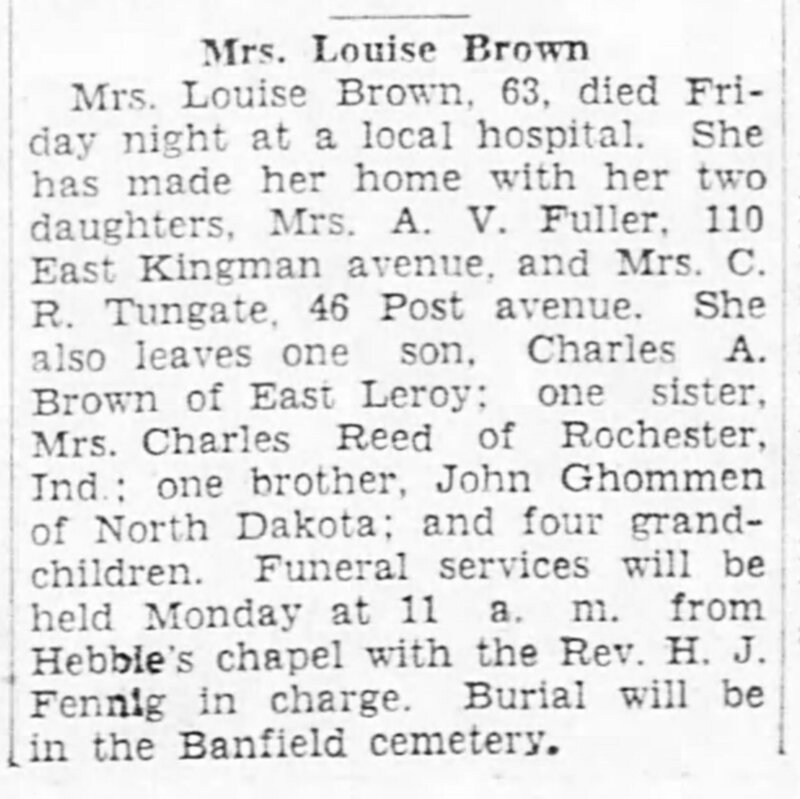 Source: Obituary of Mrs. Louise Brown, Battle Creek Enquirer (Battle Creek, MI), Sunday 17 May 1931. 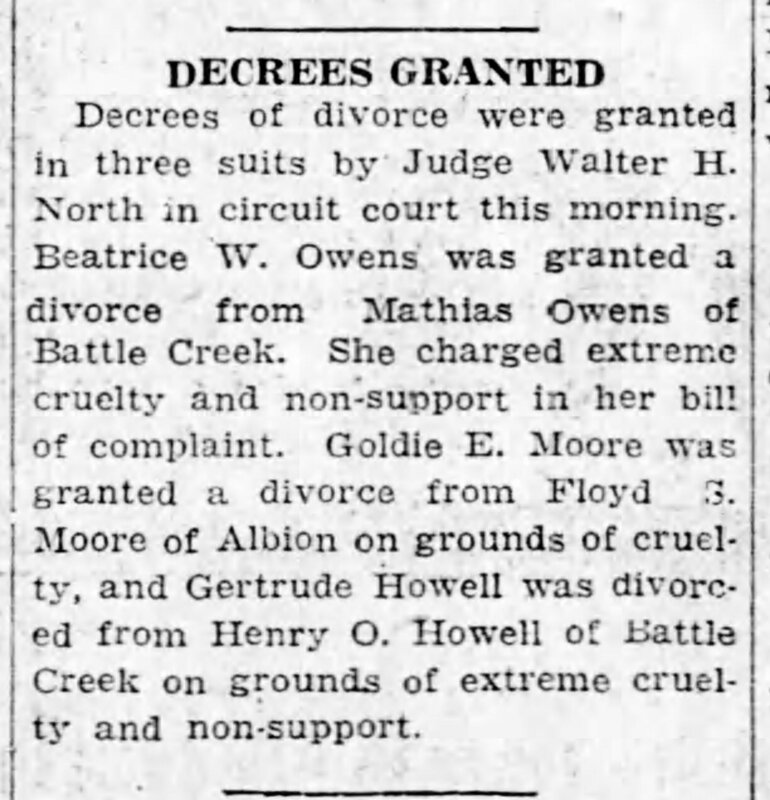 Source: Goldie E. Fuller denies charges in divorce case, Battle Creek Enquirer (Battle Creek, MI), Monday 2 May 1932. 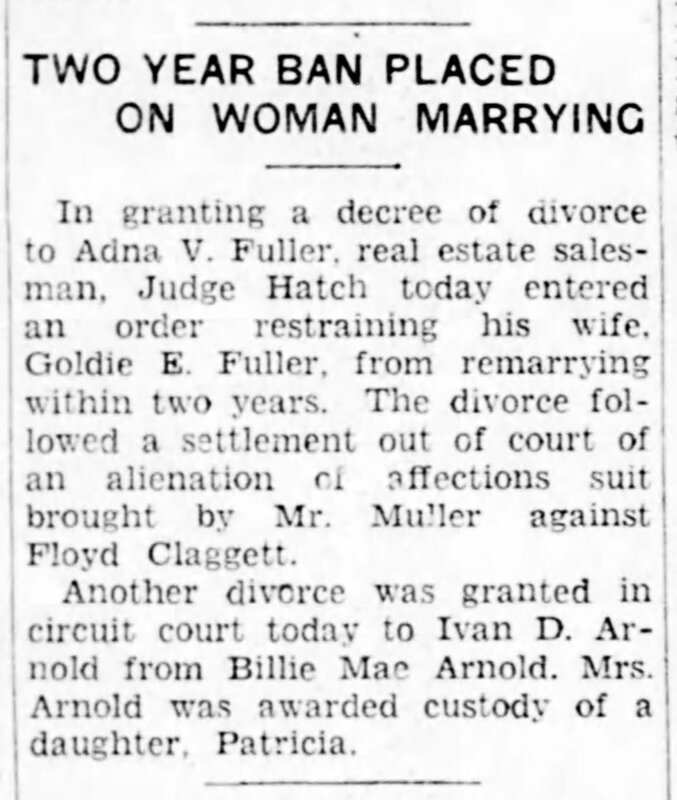 Source: "Two Year Ban Placed on Woman Marrying," Battle Creek Enquirer (Battle Creek, MI), Friday 24 June 1932. Source: "Search for Prowlers," Battle Creek Enquirer (Battle Creek, MI), Saturday 25 June 1932. Source: "Held for Investigation," Battle Creek Enquirer (Battle Creek, MI), Monday 26 June 1933. 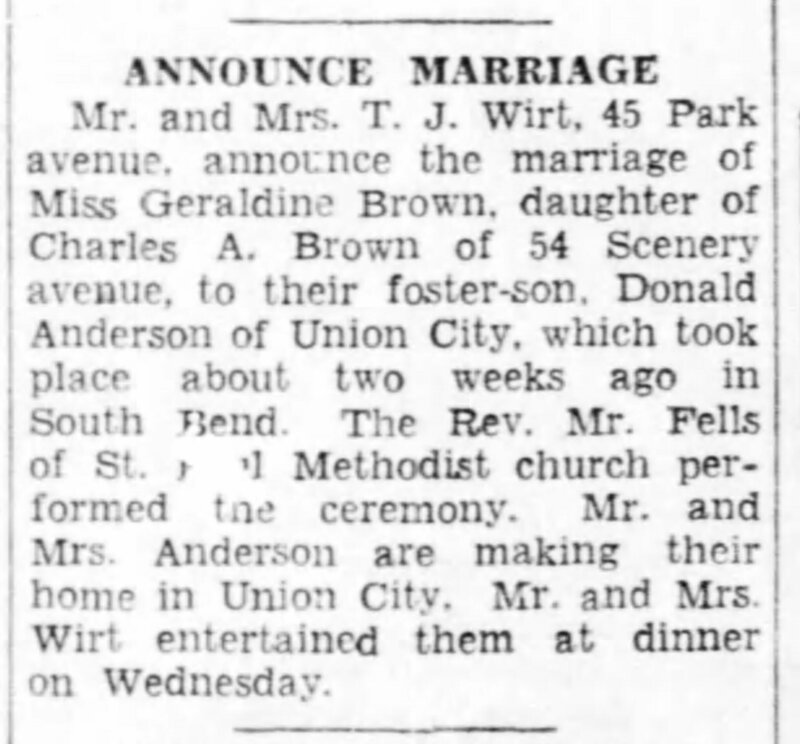 Source: "Announce Marriage," Battle Creek Enquirer (Battle Creek, MI), Thursday 31 May 1934. 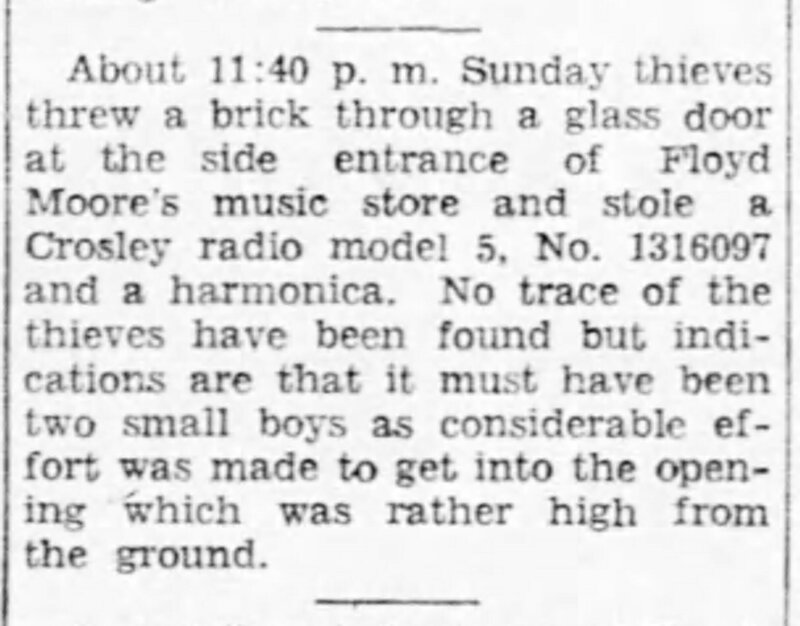 Source: Report of burglary at Floyd Moore's store, Battle Creek Enquirer (Battle Creek, MI), Monday 23 March 1936. 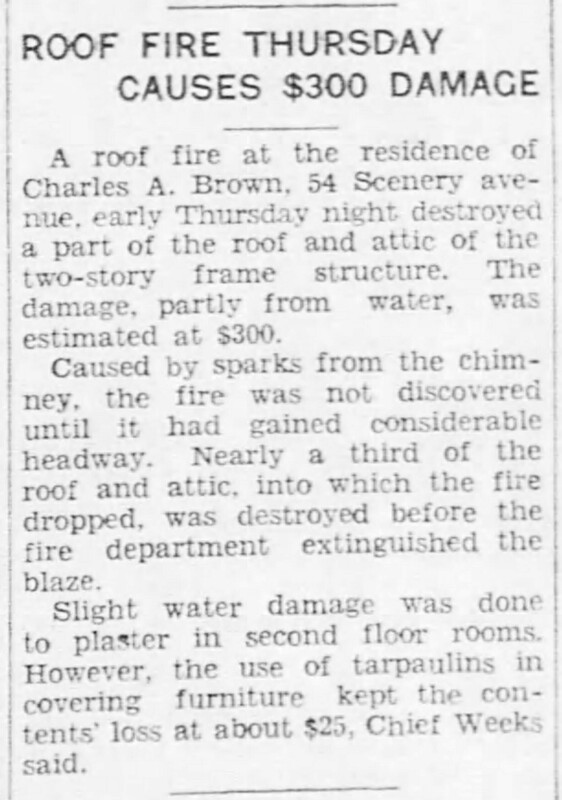 Source: "Roof Fire Thursday Causes $300 Damage," Battle Creek Enquirer (Battle Creek, MI), Friday 24 April 1936. 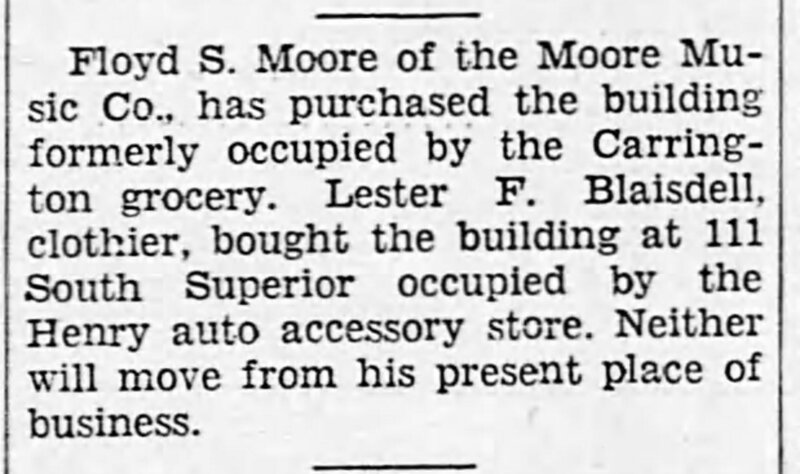 Source: Report of Floyd S. Moore purchasing building, Battle Creek Enquirer (Battle Creek, MI), Tuesday 22 September 1936. 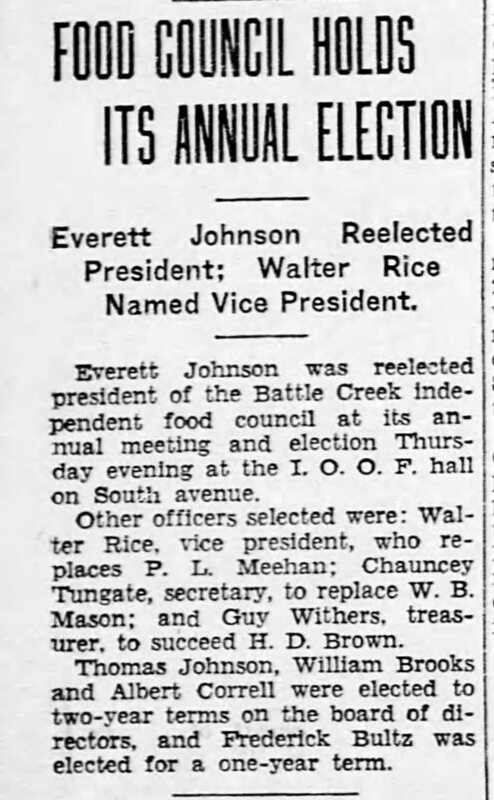 Source: "Food Council Holds Its Annual Election," Battle Creek Enquirer (Battle Creek, MI), Saturday 10 October 1936. Source: "Prominent Man, 48, Dies at Club," Battle Creek Enquirer (Battle Creek, MI), Monday 27 September 1937. 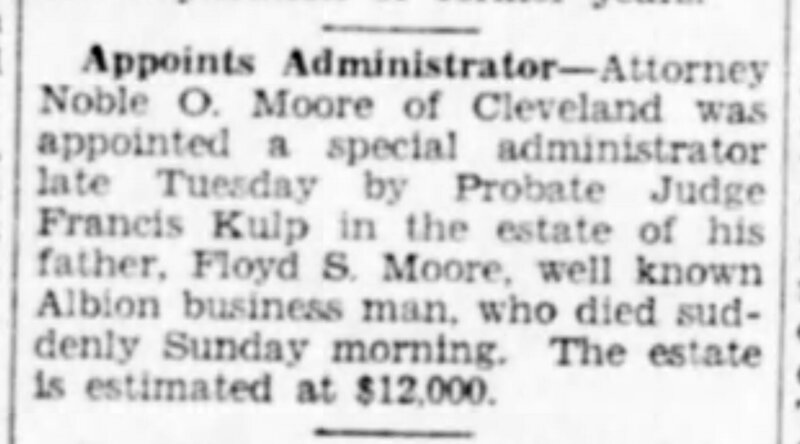 Source: "Appoints Administrator," Battle Creek Enquirer (Battle Creek, MI), Wednesday 29 September 1937.